Early European explorers into East Tennessee area encounter native tribes living in large villages. 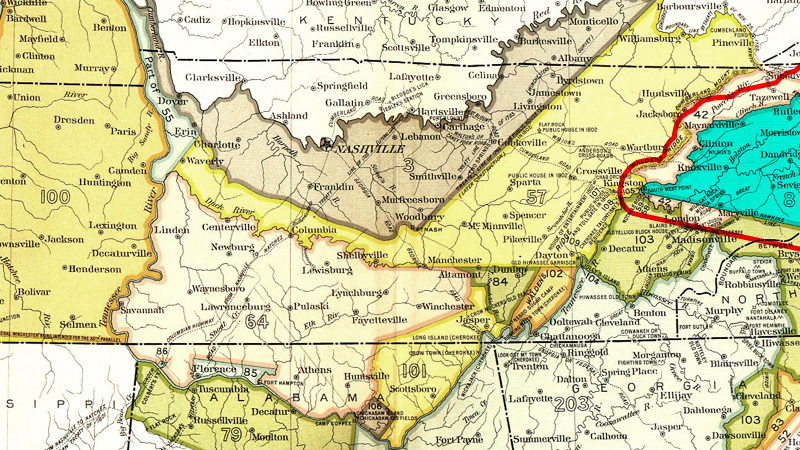 The ethnographic tribe in the Oak Ridge area became known as Overhill Cherokee with the center of their population in the Little Tennessee River Valley. U.S. President, George Washington, and Chiefs and Warriors of the Cherokee Nation of Indians sign Treaty of Holston, relinquishing a large tract of Cherokee land east of the Clinch River for settlement. 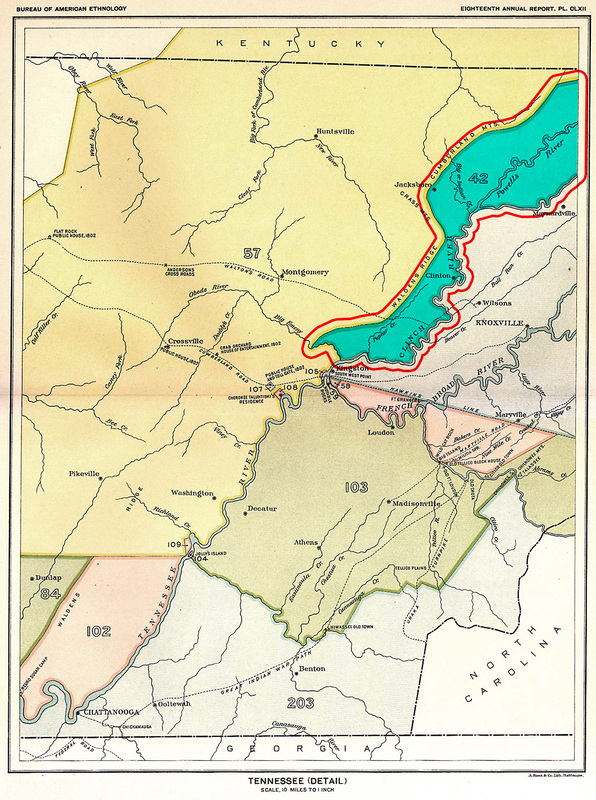 The Treaty of Tellico opened the land west of the Clinch River to settlement. However, due to failure to mark the boundaries of the treaty, white settlers had been living on the land for a number of years. Elias Roberts buys 500 acres on the Clinch River at the mouth of Poplar Creek. 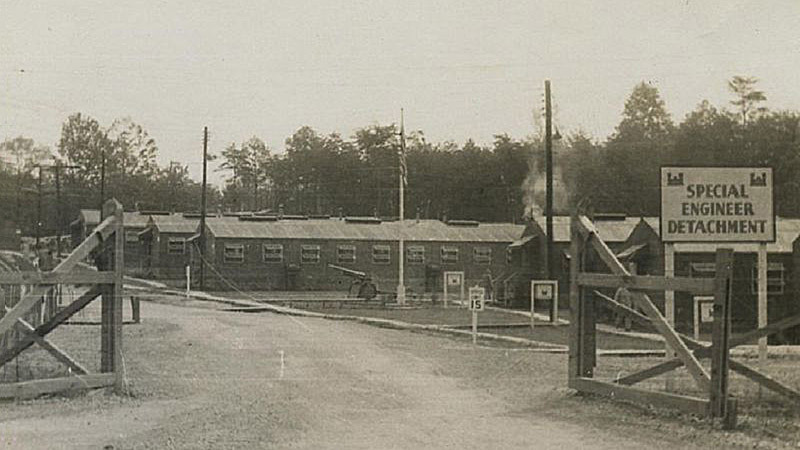 More than 100 years later, the property becomes part of covert U.S. military strategy. Anderson and Roane Counties (Tennessee) established. Poplar Creek Post Office opens in the area known as Bald Hill. Henry Franklin Wheat opens a post office in Bald Hill. The post office and community became known as Wheat. Cambridge University's Joseph John (J.J.) Thomson discovers the electron. 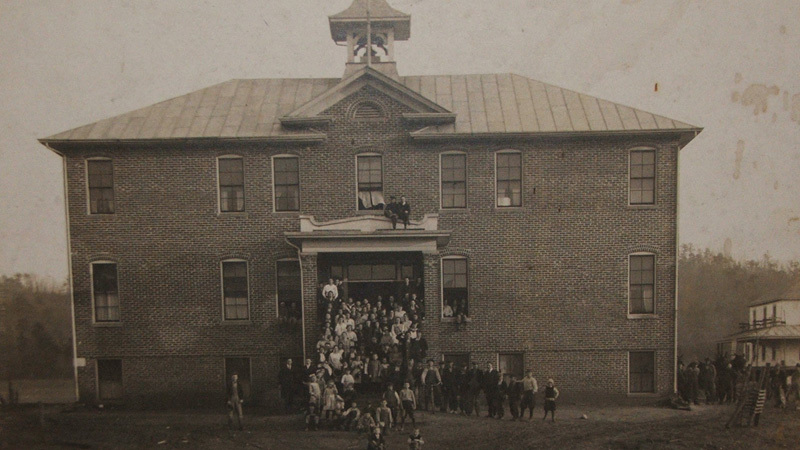 Wheat School established (meets in former Roane College building). 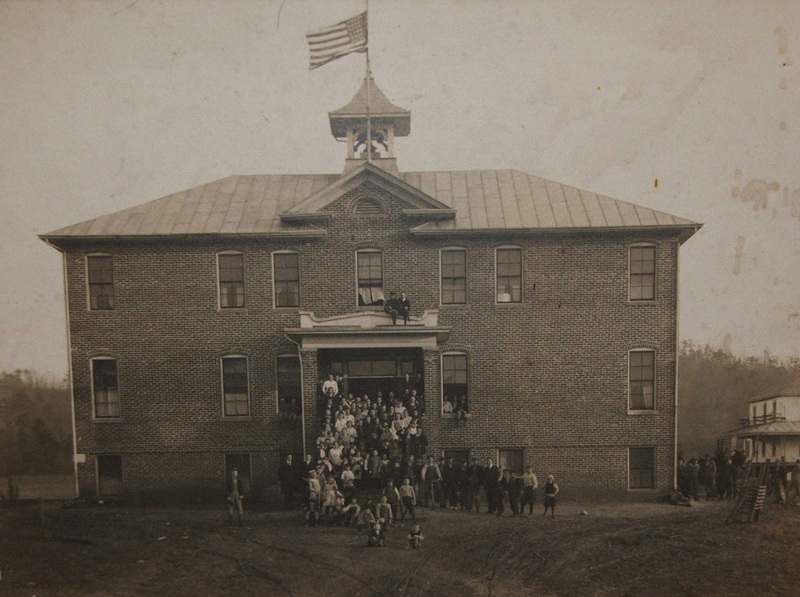 New brick facility constructed in 1916. New Zealand-born Ernest Rutherford discovers the proton. American scientist Ernest Lawrence invents the cyclotron, what he calls a "proton merry-go-round." 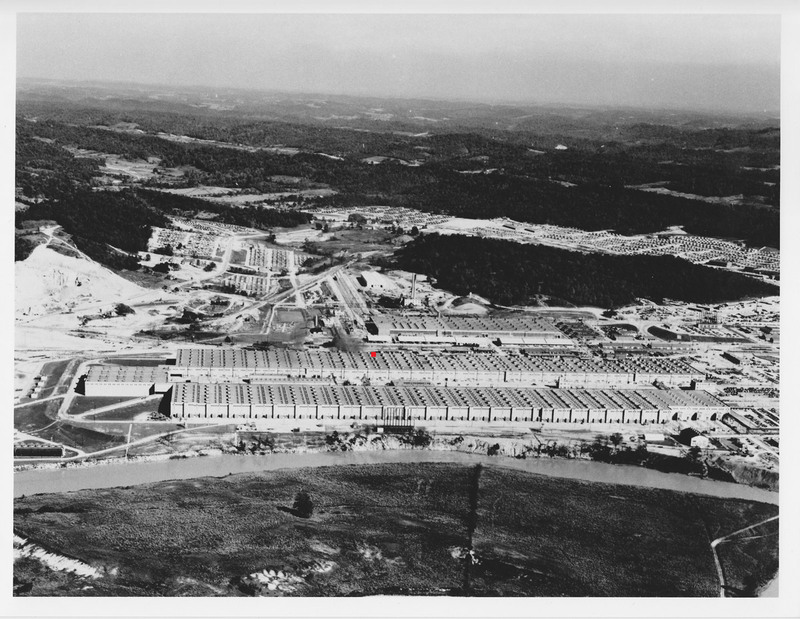 Lawrence's invention of the cyclotron later led to the use of the calutron (California University cyclotron) at the covert military site to be built in East Tennessee 12 years later. At Princeton University, Robert Van de Graaff develops the electrostatic generator, which continues to advance atomic study. 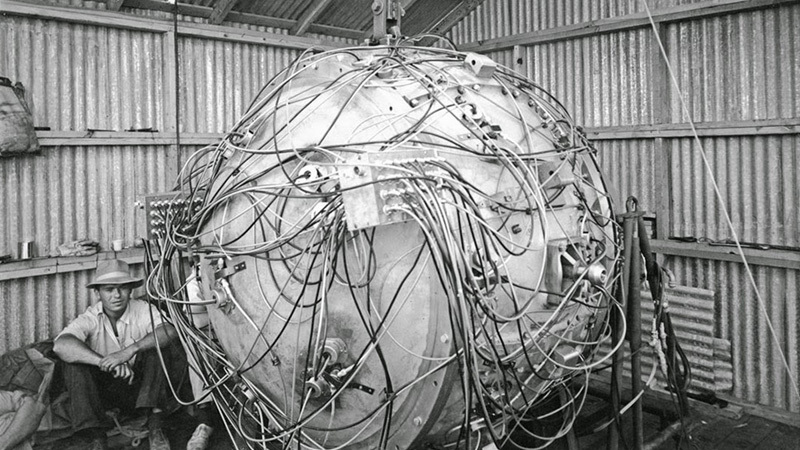 English physicist James Chadwick discovers the neutron. 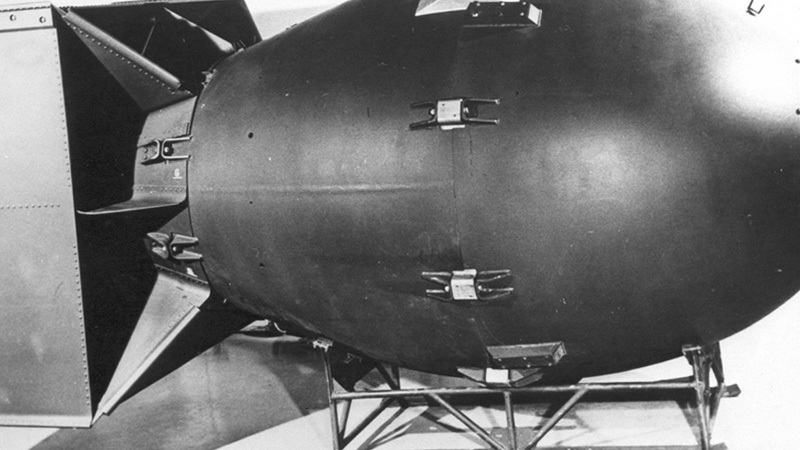 Enrico Fermi's discoveries during neutron bombardment will lead to nuclear fission. Tennessee Valley Authority launches cooperative program to improve agriculture through fertilizers, farming techniques, and business practices. Wheat community is chosen to be a part of the program. 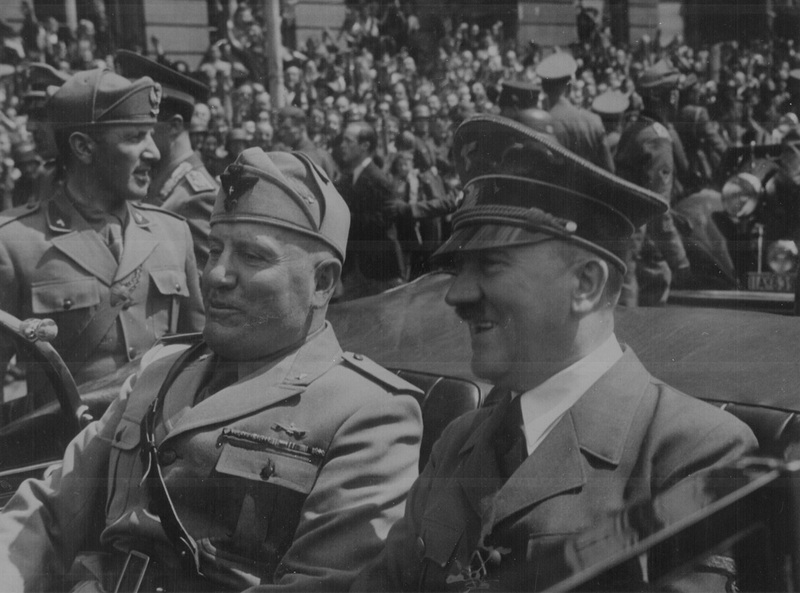 An alliance between Nazi Germany and Fascist Italy becomes the Rome-Berlin Axis. German physicists Otto Hahn and Fritz Strassman split the uranium atom. The process is coined "fission" in a paper published by Lise Meitner and her nephew, Otto Robert Frisch, in the journal Nature on February 11, 1939. 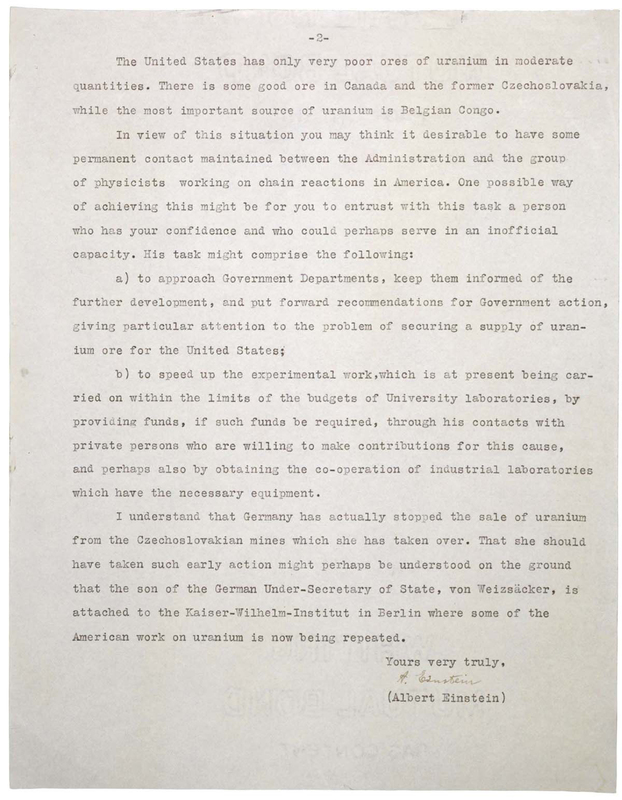 In letter to President Franklin Delano Roosevelt, renown scientist Albert Einstein warns that the nuclear chain reaction could lead to the construction of "extremely powerful bombs." 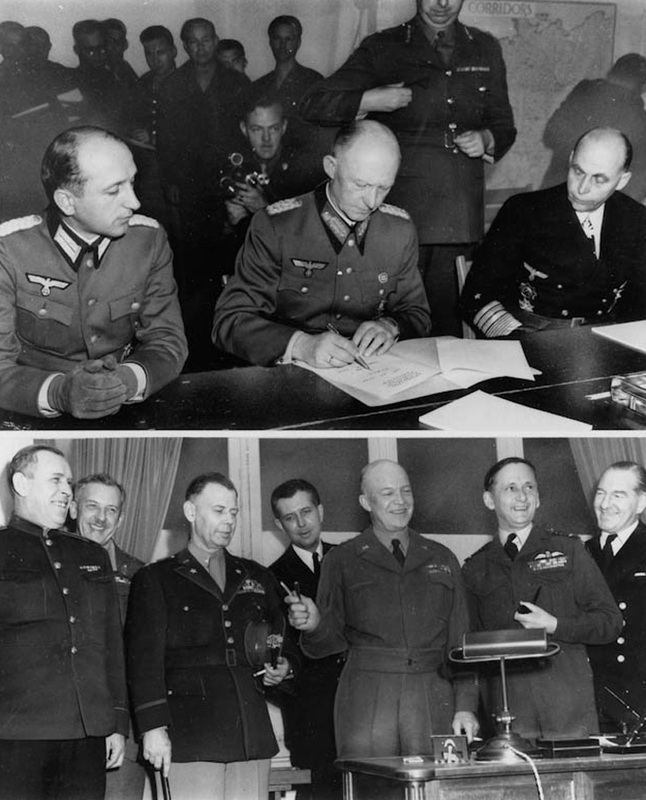 Germany invades its neighbor to the east, Poland, marking the official start of World War II. President Roosevelt establishes an Advisory Committee on Uranium to investigate current research on uranium; authorization for limited research funding soon followed. A team of Columbia University scientists investigate uranium isotope separation by the gaseous diffusion method sponsored by the Naval Research Laboratory. 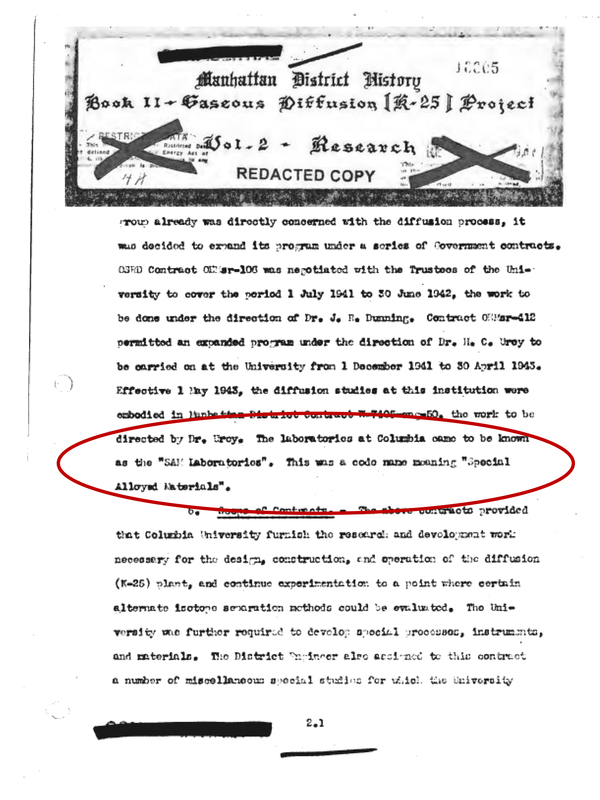 Convinced that the United States could not escape involvement in World War II, advisors to President Roosevelt request the creation of a formal scientific body to organize research efforts pertaining to the war effort. Subsequently, the president establishes the National Defense Research Committee "to coordinate, supervise, and conduct scientific research on the problems underlying the development, production, and use of mechanisms and devices of warfare." Foreign-born scientists were excluded from membership on the committee but included in research and development activities. 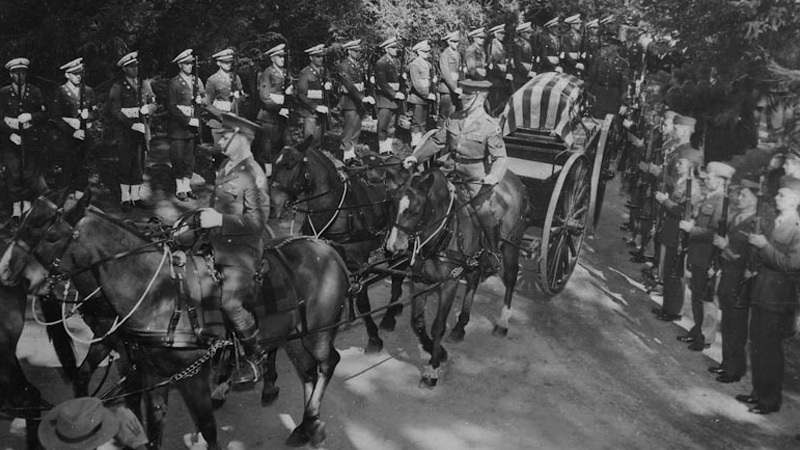 U.S. halts oil shipments to Japan after Japanese troops invade French-colonized Indochina. 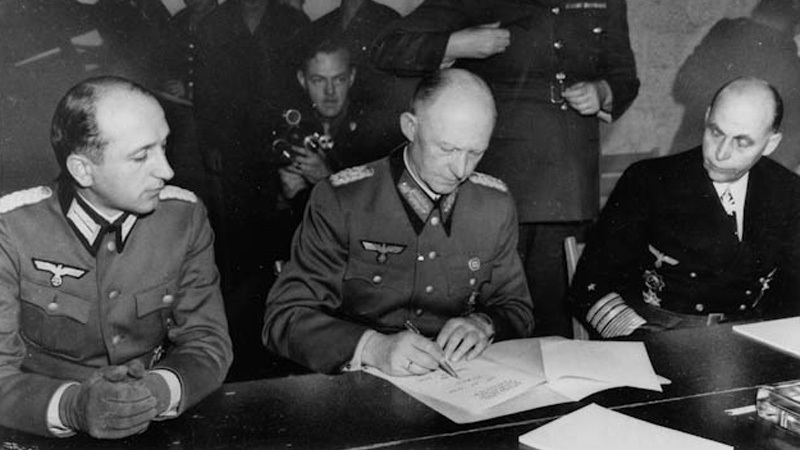 Japan officially joins the "Axis" Alliance with the signing of the Tripartite Pact. Glenn T. Seaborg's research group at the University of California, Berkeley discovers plutonium. 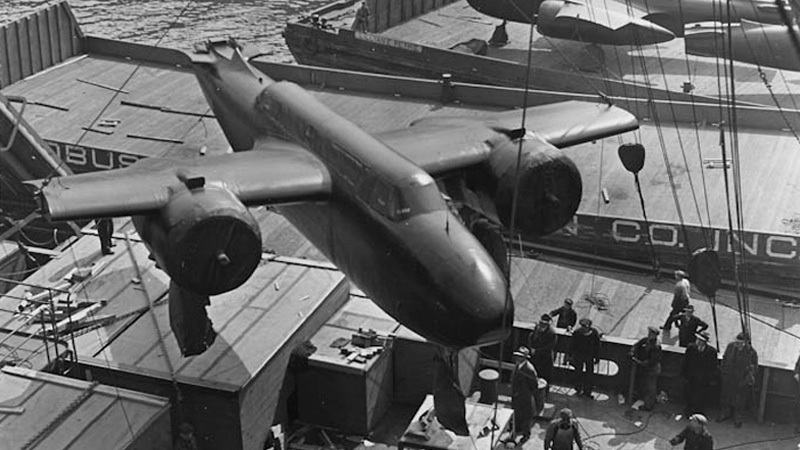 Despite public and congressional support of isolationism due to the trials of the Great Depression and significant human losses in World War I, President Roosevelt rallies support for the Lend-Lease Act, which allowed the U.S. to aid its allies with war supplies. Days after Germany invades the Soviet Union, the Office of Scientific Research and Development is established by Executive Order. With direct access to the president and authority to enter into contracts and agreements, the Office quickly engages the scientific community. The Office of Scientific Research and Development awards Columbia University a contract to study the gaseous diffusion process under the direction of Professor John R. Dunning. The diffusion research facilities at Columbia are code-named SAM Laboratories for Special Alloyed Materials. 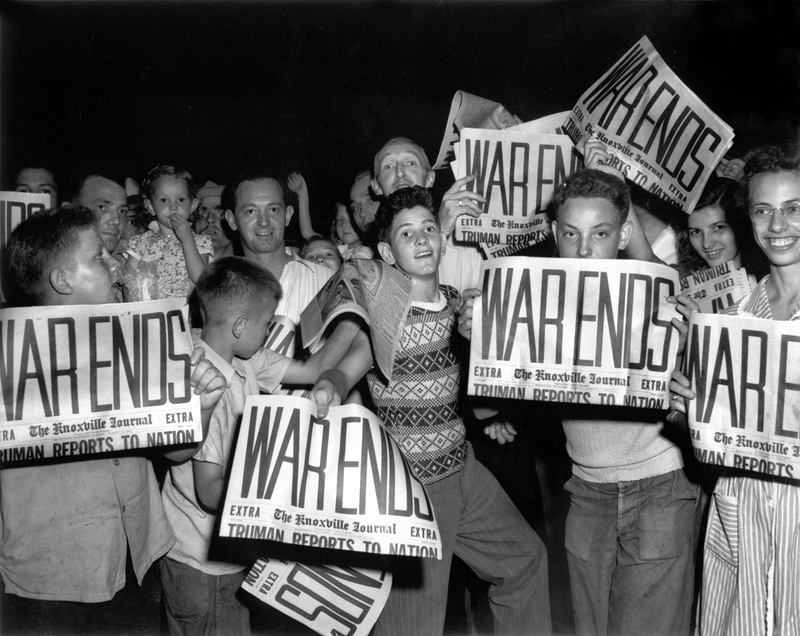 Japanese bomb Pearl Harbor; U.S. declares war on Japan. 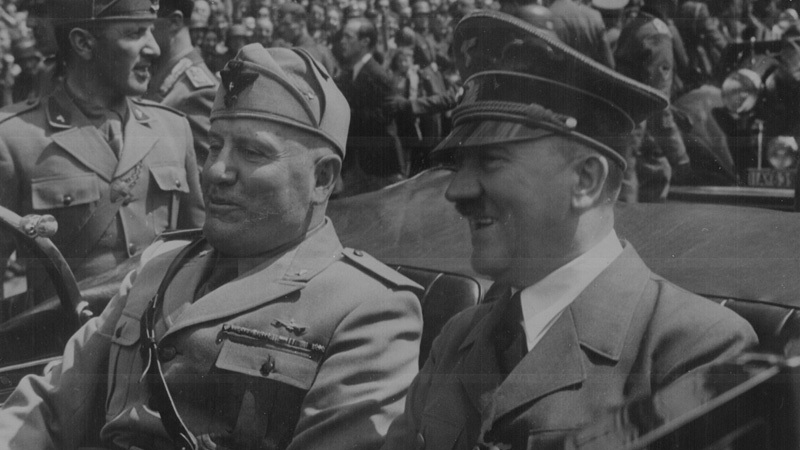 Germany and Italy declare war on the United States. The M.W. Kellogg Company hired to perform engineering studies and experimental work on gaseous diffusion. 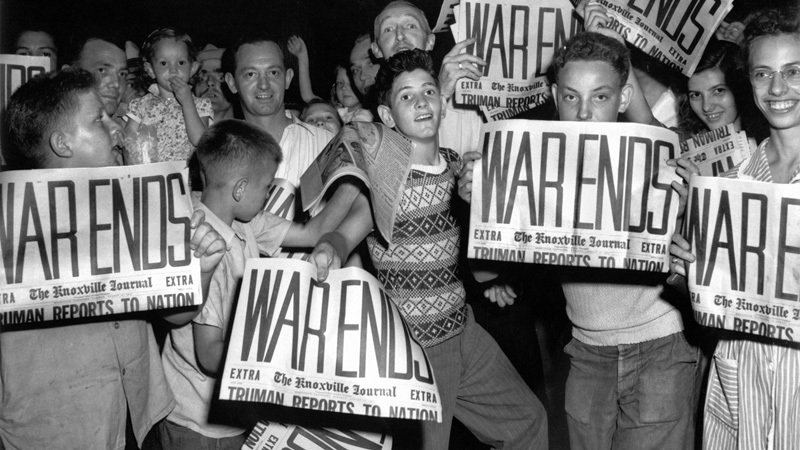 President Roosevelt approves atomic weapon production. 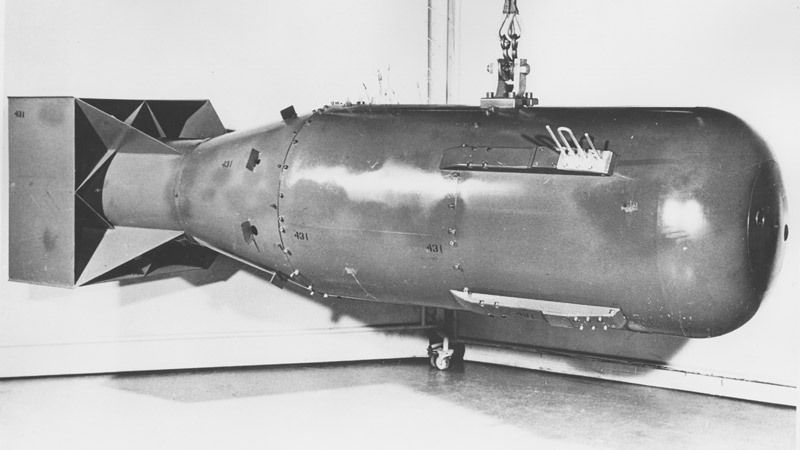 Ultimately, the United States would pursue two paths to bomb development – uranium separation and plutonium production. U.S. and Filipino soldiers surrender to Japanese troops on the Bataan Peninsula in the Philippines. In what was later called the Bataan Death March, 75,000 prisoners were forced to walk 60-plus miles across the peninsula to war camps. 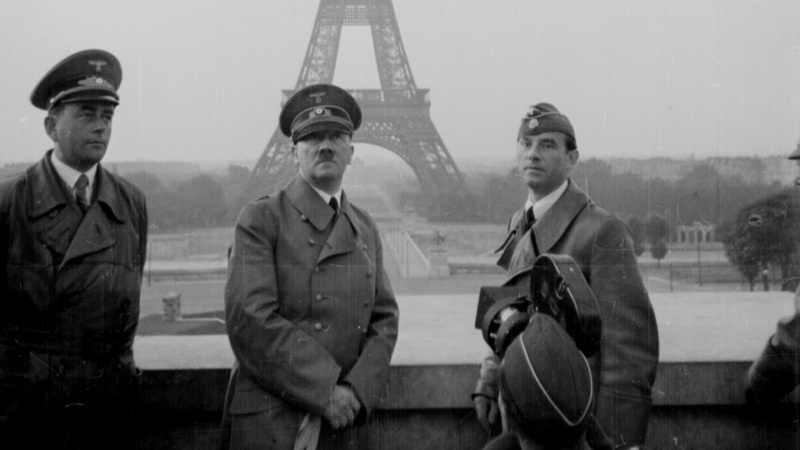 Thousands died on the brutal march and subsequent imprisonment. 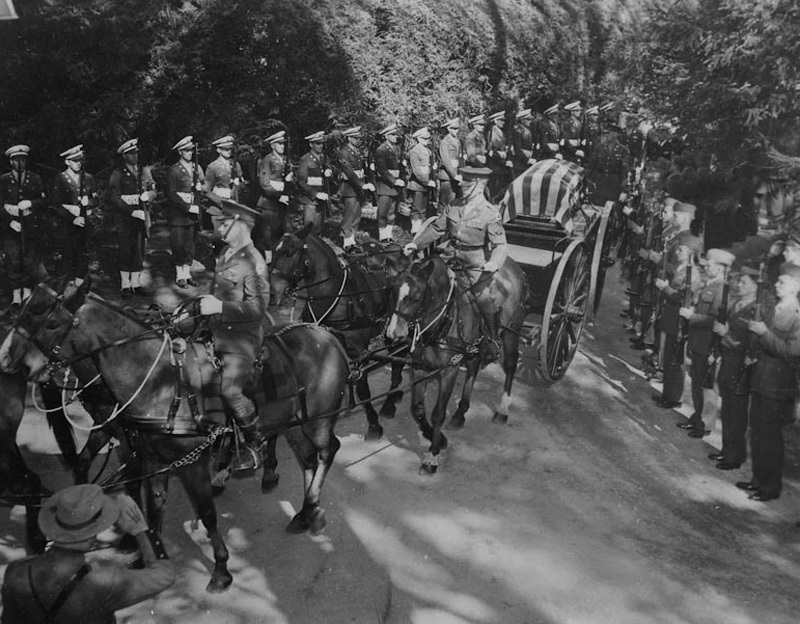 As the project moved from pure research to production planning, leadership transferred to the armed forces. 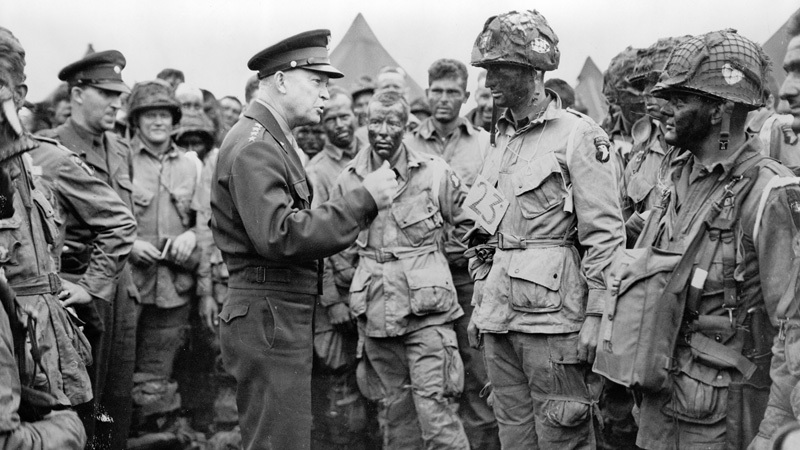 An Army officer would assume overall command of the project. The officer would execute his assignment through the expertise of the Corps of Engineers, the Army's engineering and construction division. The Office of Scientific Research and Development would continue to oversee research and pilot plant studies and advise the Army of changes/updates that would influence engineering and design. U.S. Navy defeats Japan in the Battle of Midway, a turning point for Allied forces on the Pacific front. The Army Corps of Engineers establishes the project's first headquarters – the Manhattan Engineer District – at 270 Broadway in New York City. 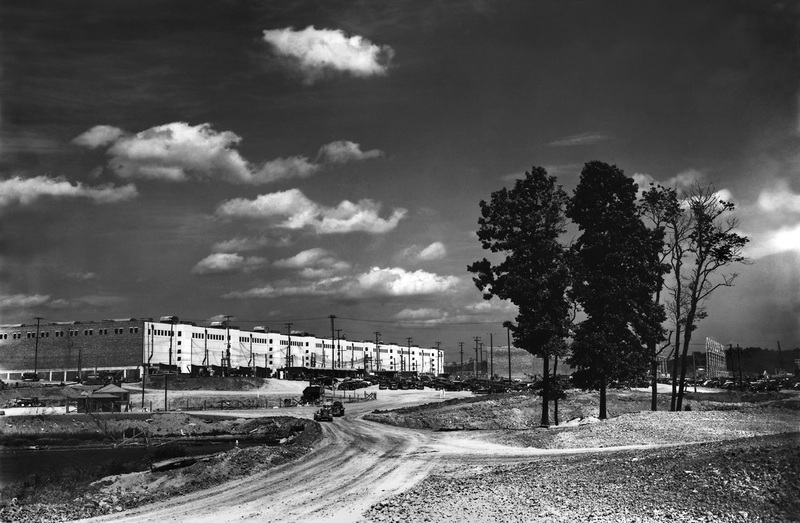 Soon known as the Manhattan Project, its headquarters would immediately move to Washington, DC. 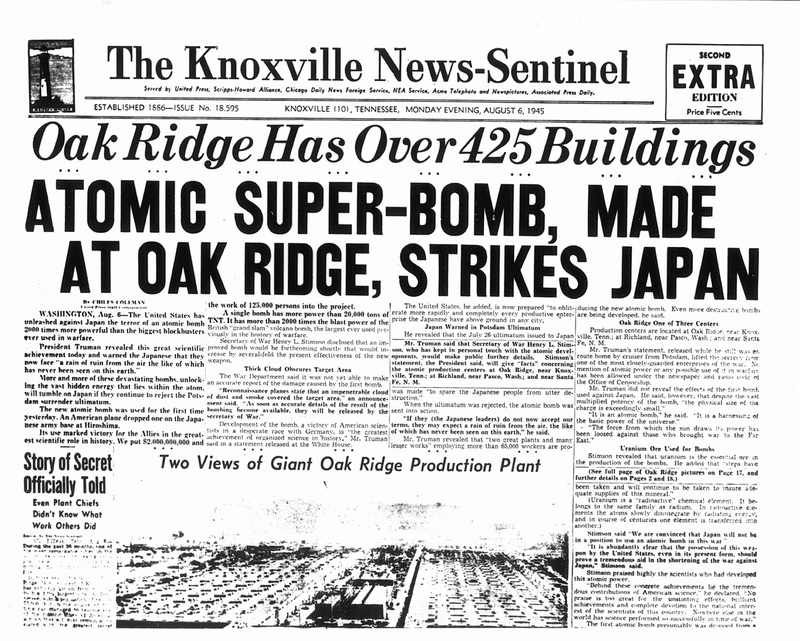 Within a year, East Tennessee becomes the center of Manhattan Project operations nationwide. 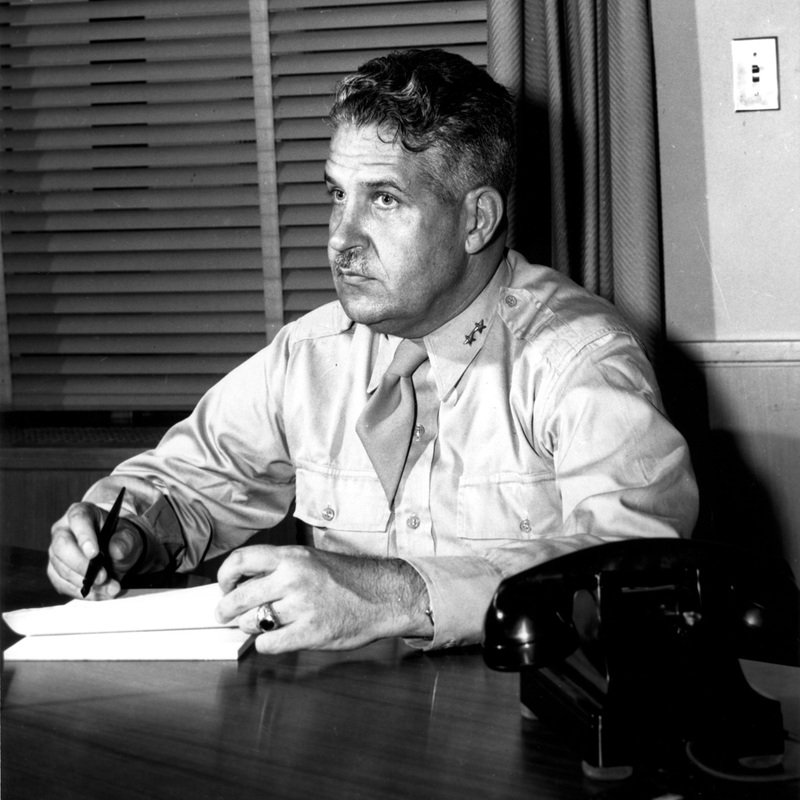 The Army appoints Colonel Leslie R. Groves to command the Manhattan Project. 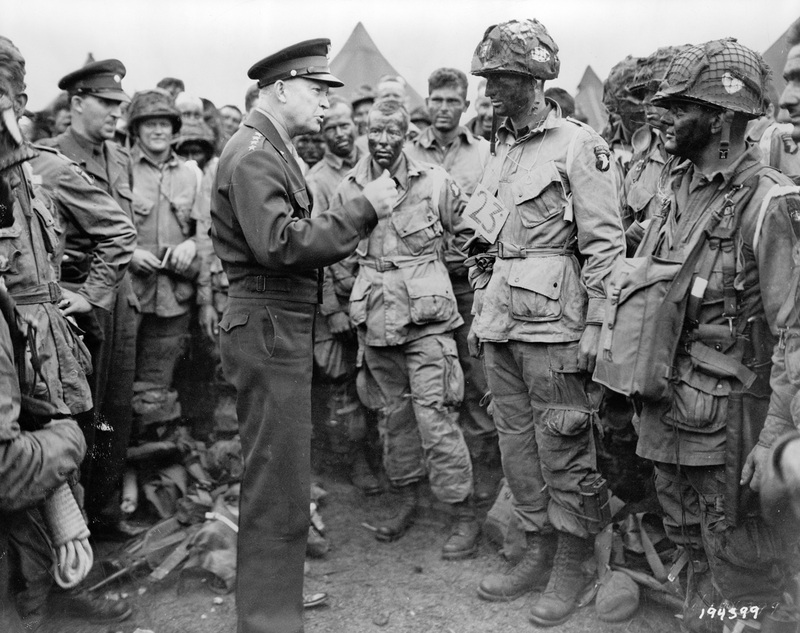 Six days later, he is promoted to Brigadier General. His resume includes the recently completed Pentagon, the world's largest building under one roof at the time. 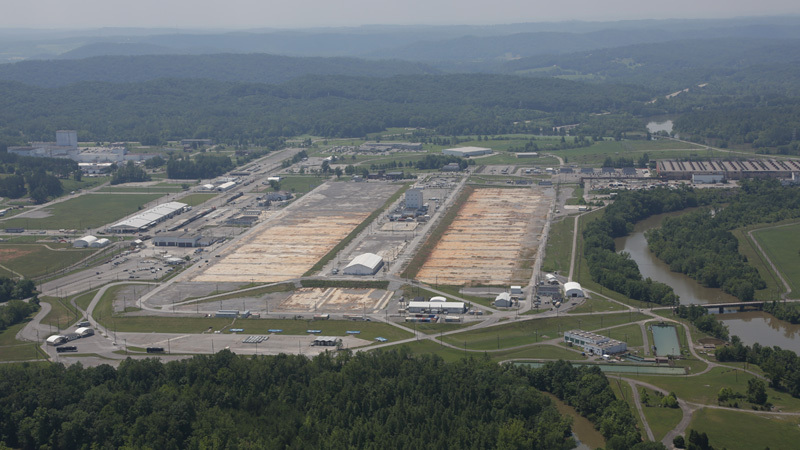 Groves expedites acquisition of a rural site in East Tennessee for production (uranium) and pilot (plutonium) facilities. 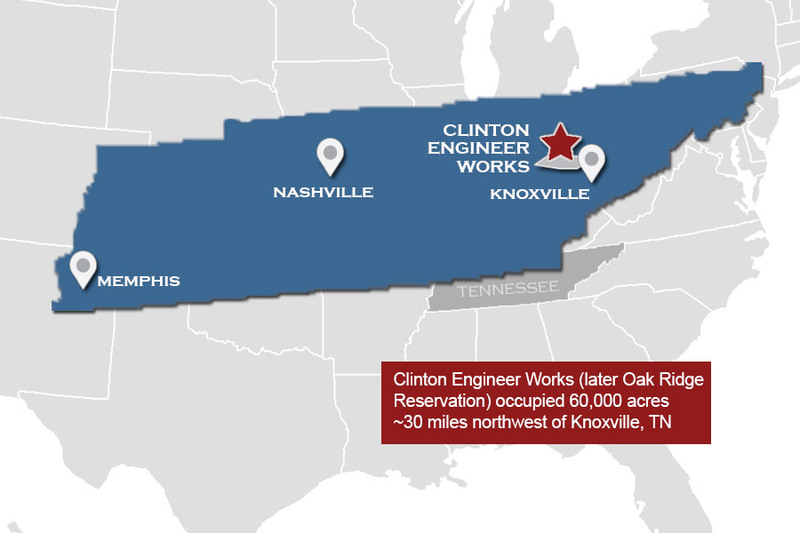 Clinton Engineer Works, named for the county seat of Anderson County, would span nearly 60,000 acres. 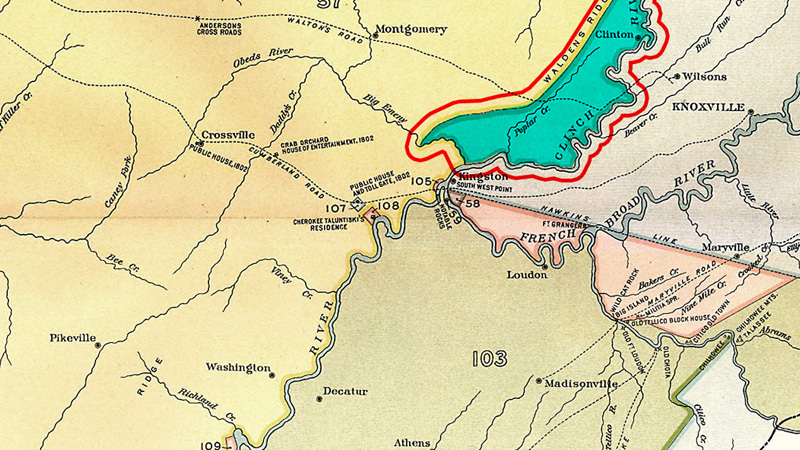 Surrounded on three sides by water, the landscape included natural barrier ridges that planners hoped would provide some protection from production accidents and would promote concealment from saboteurs. Three uranium enrichment plants will be built using gaseous diffusion (K-25), electromagnetic isotope separation (Y-12), and liquid thermal diffusion (S-50) methods. 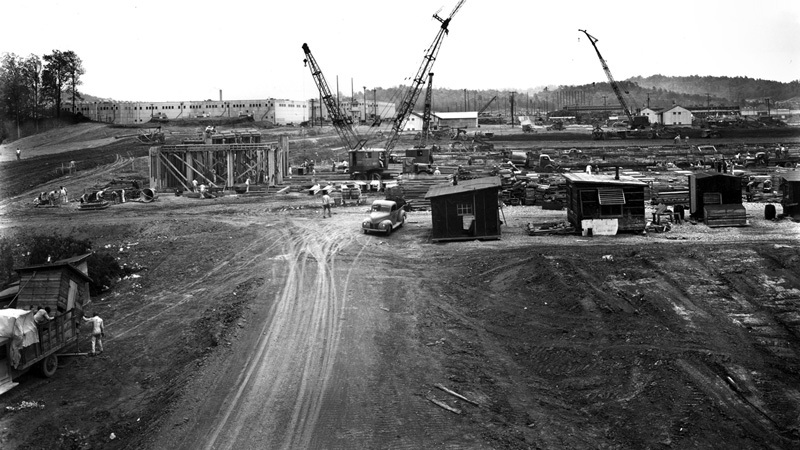 Pilot pile (reactor) and plutonium separation facilities are built and operated in what becomes known as X-10 area. Groves selects Los Alamos, New Mexico, as site for separate scientific laboratory to design an atomic bomb. 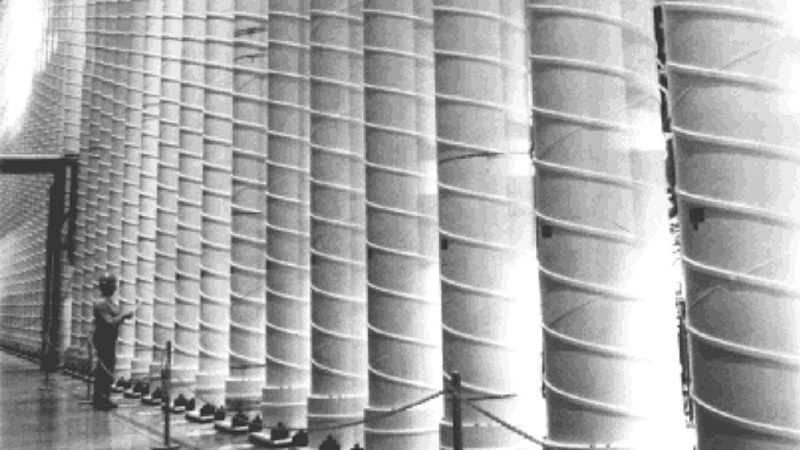 At the University of Chicago, scientists led by Enrico Fermi achieve the first self-sustained nuclear chain reaction in pile (reactor) constructed under the west grandstand at Stagg Field. M.W. Kellogg receives authorization to proceed with engineering on a large-scale gaseous diffusion plant. 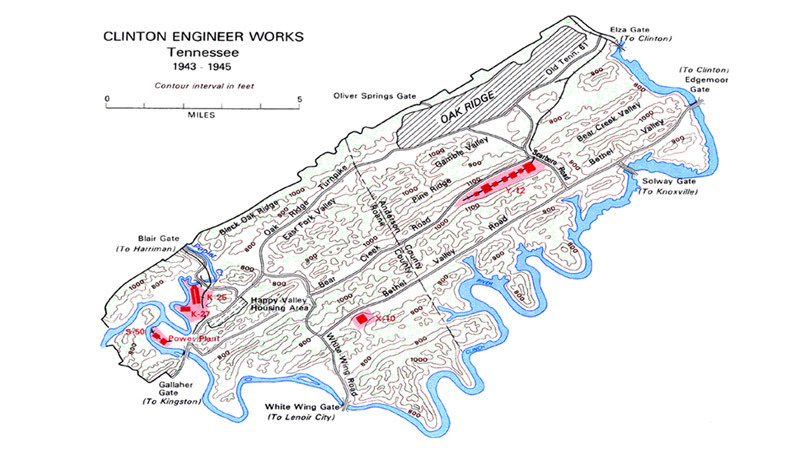 President Roosevelt authorizes and funds construction of full-scale gaseous diffusion and plutonium production plants in addition to electromagnetic and heavy water facilities. Scientists and engineers continue to struggle with design and manufacture of the porous barrier material required for successful uranium enrichment using the gaseous diffusion process. 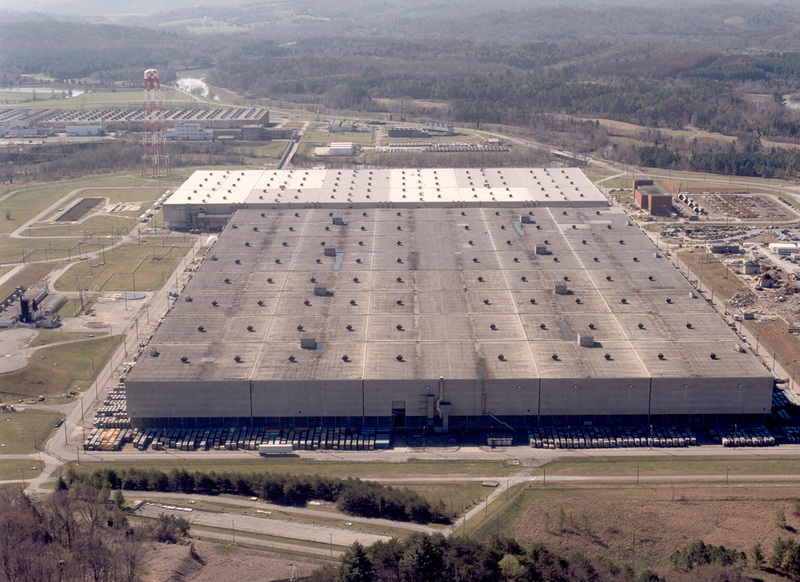 When an Edward Norris/Edward Adler design appeared to provide the highest probability for success, General Groves authorizes full-scale production. 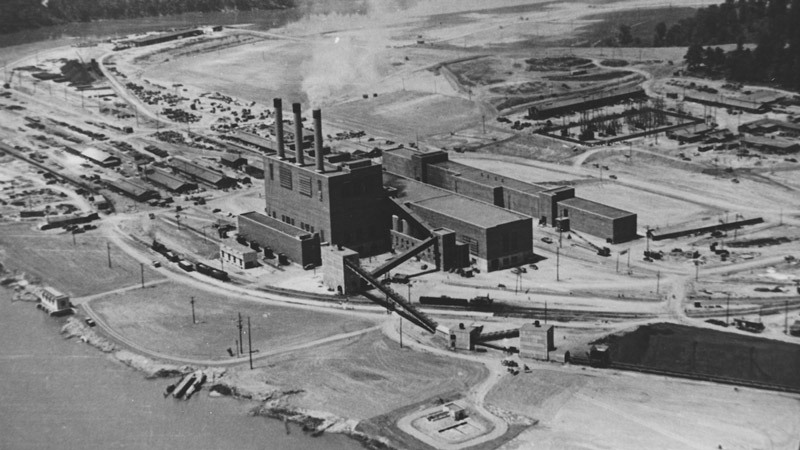 The Houdaille-Hershey Corporation would build and operate the facility in Decatur, Illinois. Groves selects Hanford, Washington, as site for full-scale plutonium production and separation facilities. 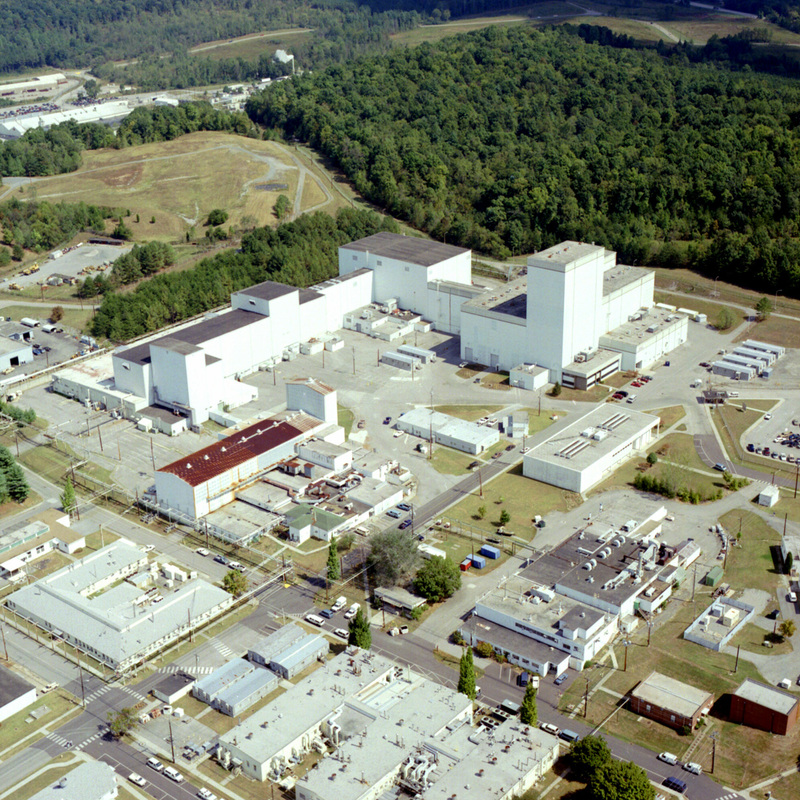 Three reactors - B, D, and F - are built. 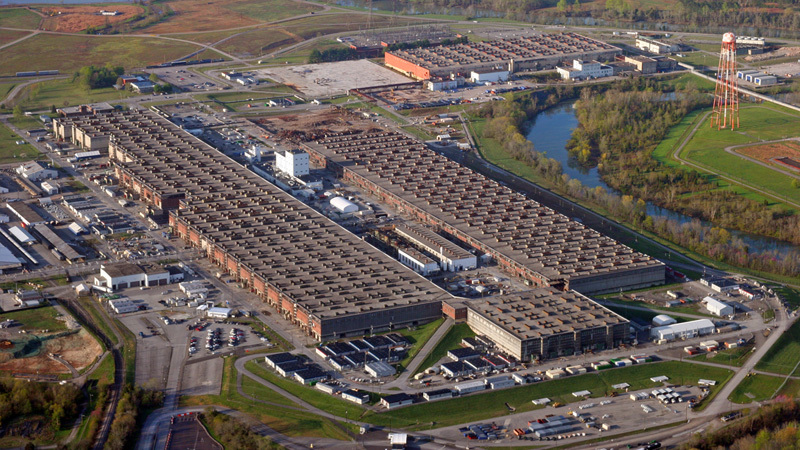 Carbide and Carbon Chemicals Company, a Division of Union Carbide and Carbon Corporation, accepts contract to operate the large-scale gaseous diffusion plant in Tennessee. For security and accounting reasons, the M.W. Kellogg Company creates Kellogg Experimental or Kellex Corporation to execute gaseous diffusion design. After six-month campaign, U.S. takes Guadalcanal in the Solomon Islands, capturing Japan's farthest-reaching outpost. 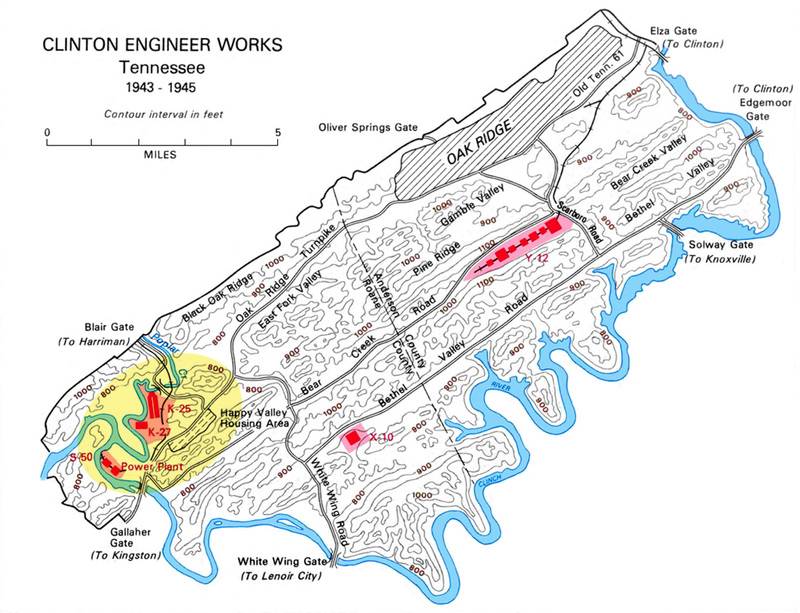 A site 11 miles southwest of Clinton Engineer Works' town center (later to become Oak Ridge, TN) is selected for the gaseous diffusion plant. The site was west of McKinney Ridge on Poplar Creek, near the Wheat School. Gaseous diffusion studies at Columbia University were taken over by the Manhattan Project with the work being directed by H.C. Urey. The J.A. 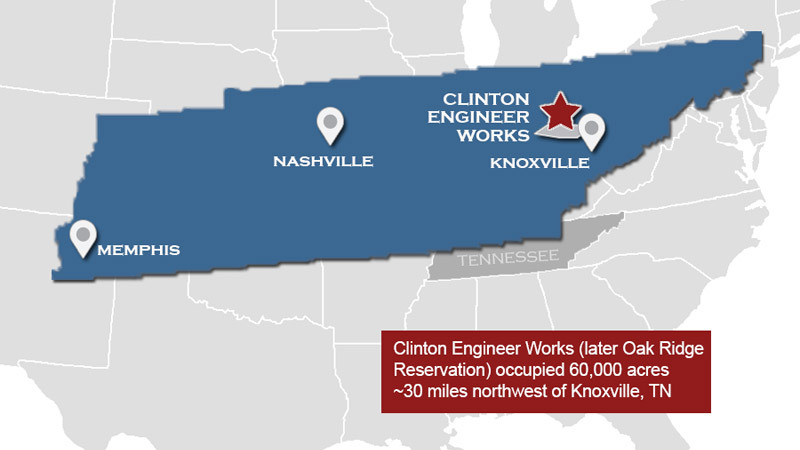 Jones Construction Company signs contracts to build the powerhouse and cascade buildings as well as administration area at Clinton Engineer Works. To address the need for more technical and scientific personnel to support the project, the Army creates the Special Engineer Detachment (SEDs). 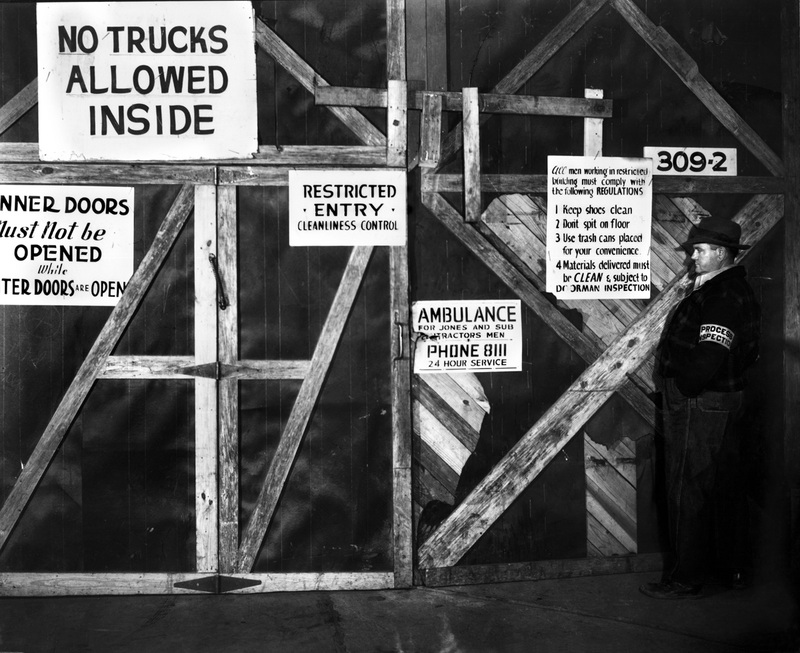 These highly skilled individuals were drafted, then deployed to Manhattan Project sites. 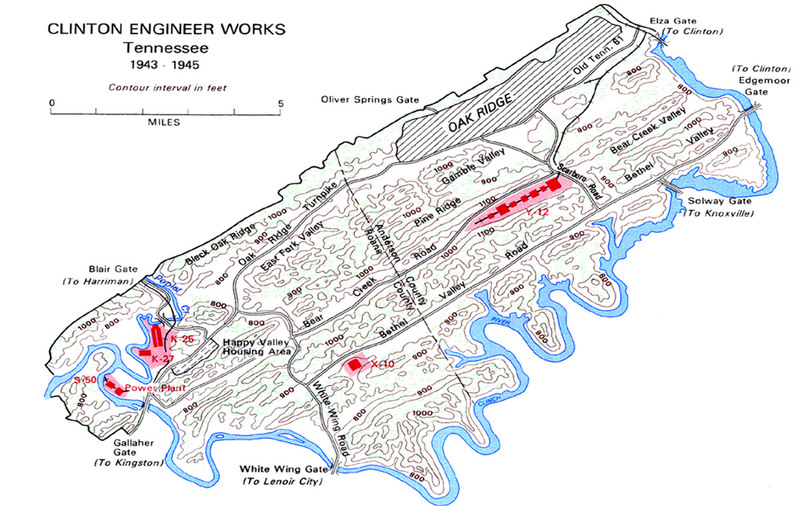 More than 1,200 SEDs joined the project in Oak Ridge. 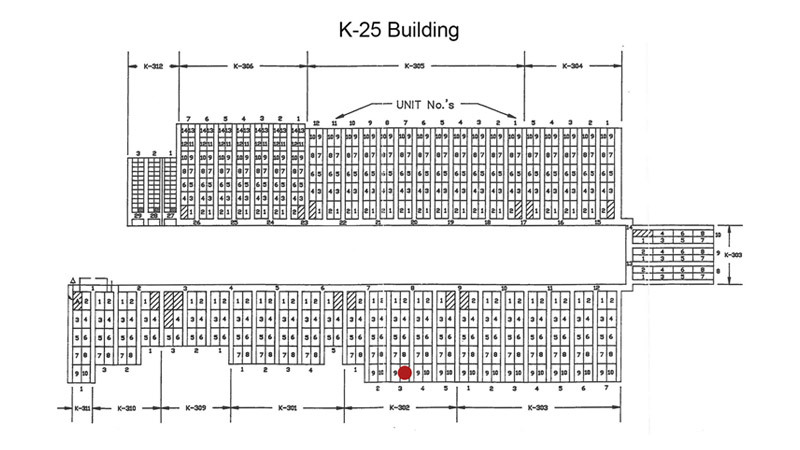 Jones Construction begins work on main gaseous diffusion process building, K-25. 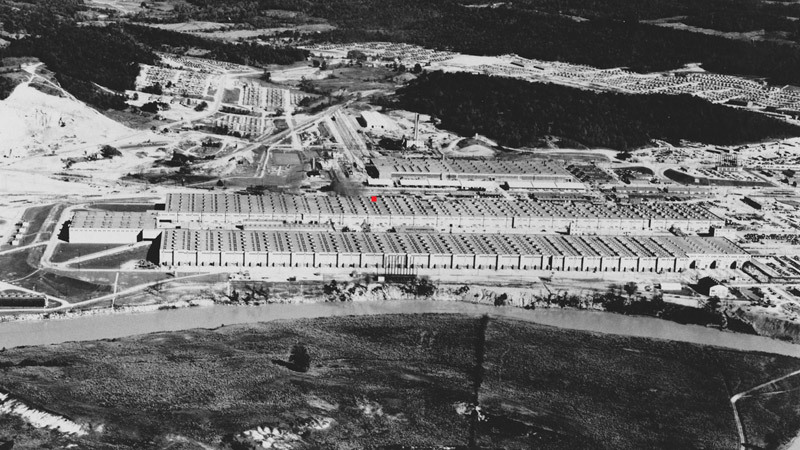 The four-story, U-shaped building spanned 44 acres and was just under a mile in length from end-to-end. 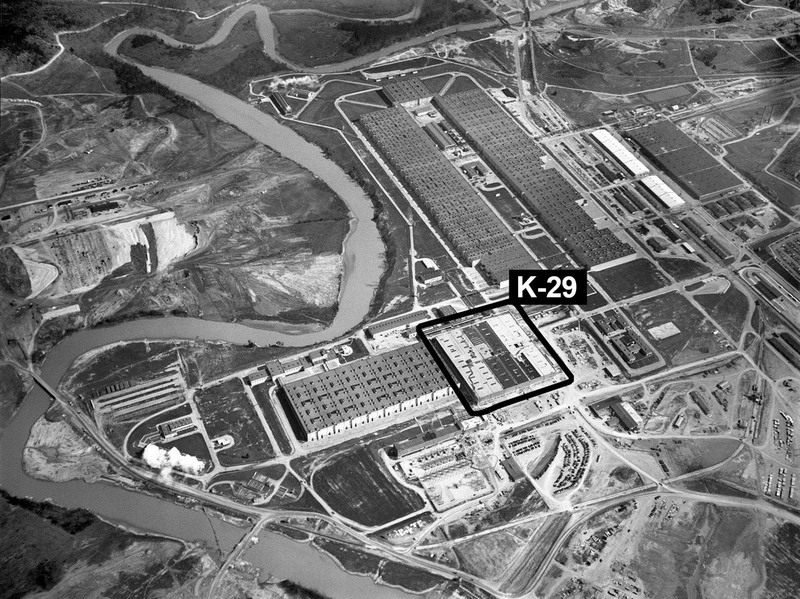 For a time, the K-25 Building would replace the Pentagon as the world's largest building under one roof. 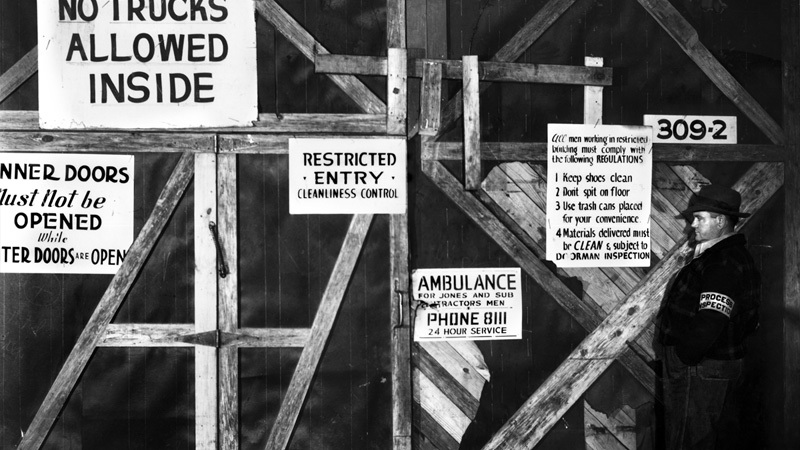 Construction commences before a barrier solution is determined. In a crash barrier production effort, Kellex develops improved barrier design. 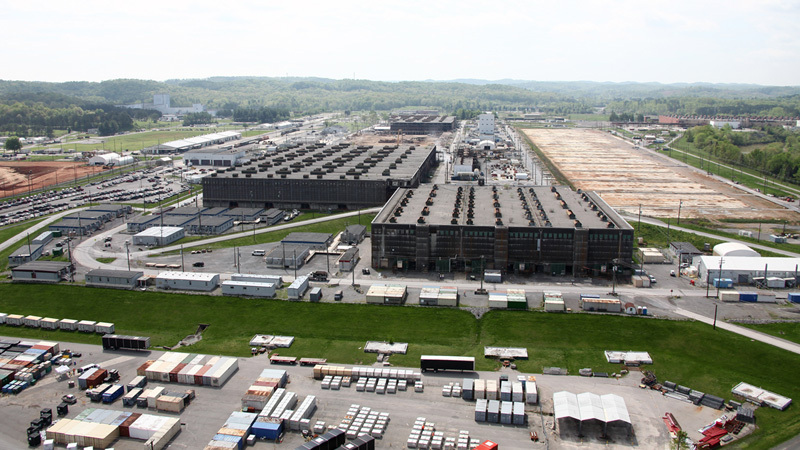 General Groves accepts Kellex barrier design and directs modification of the Houdaille-Hershey facility to manufacture the new product. 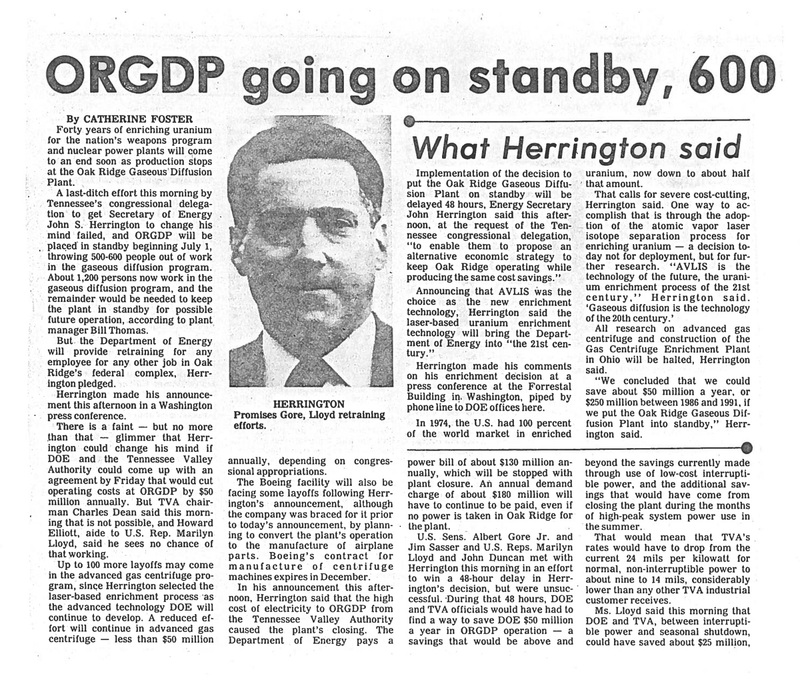 Click HERE to read Percival "Dobie" Keith's (head of Kellex Corporation) discussion on the barrier. D-Day: Allied troops invade the northern coast of France (Normandy), beginning liberation of Nazi-occupied Europe. 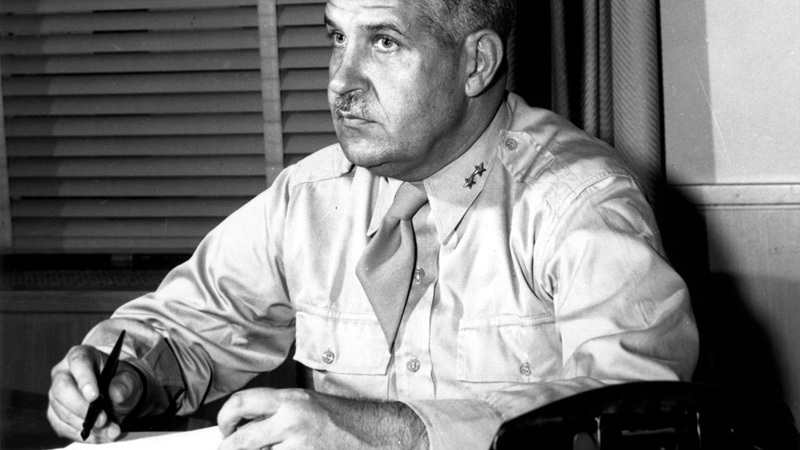 General Groves orders construction of a liquid thermal diffusion process, later known as S-50. Just 69 days after construction begins, the first unit (or rack) at S-50 is complete. 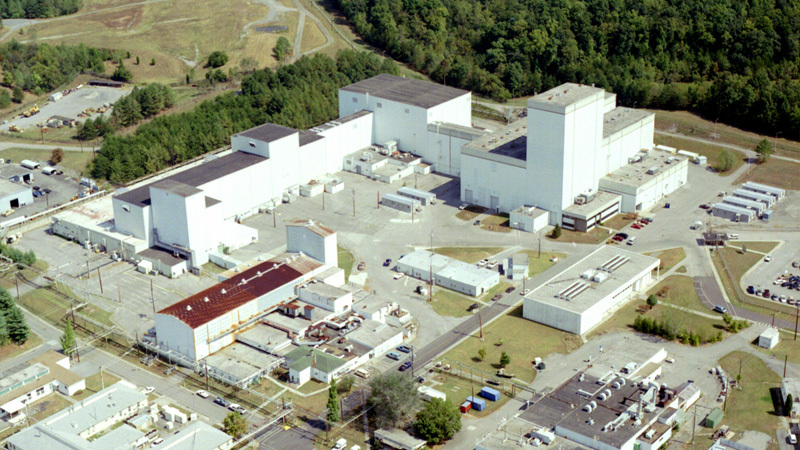 By October, the plant delivers a slightly enriched uranium product (0.852) to the Y-12 Electromagnetic Separation Plant. 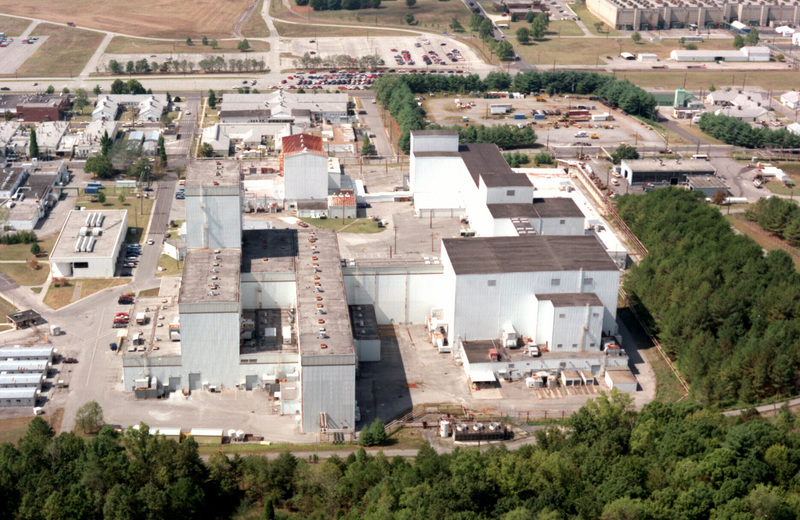 K-25 Plant receives first natural uranium feed from the Harshaw Chemical Company for the enrichment process. At Wendover Army Air Field in Utah, crews of the 509th Composite Group begin practice "Pumpkin Bomb" drops in preparation for atomic weapon deployment. 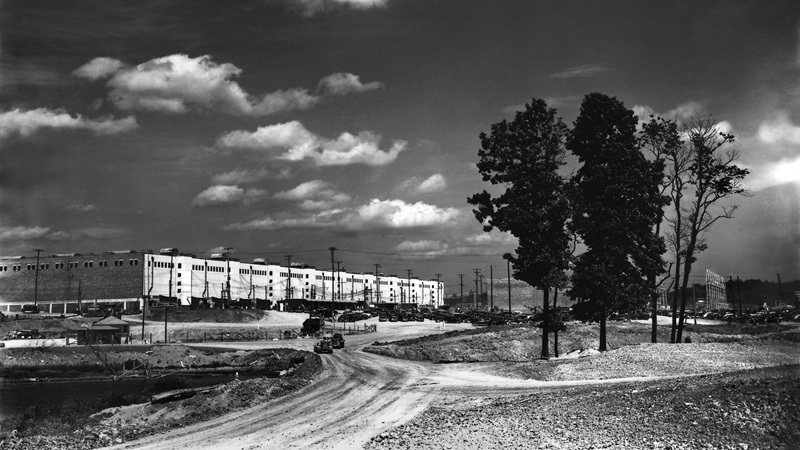 Sixteen months after construction begins, the first K-25 cell becomes operational. S-50 Thermal Diffusion Plant fully operational. Initially, S-50 product was fed to Y-12 Electromagnetic Separation Plant. As of late April, S-50 product becomes feed material for K-25 Plant. S-50 enriched product is only slightly higher than naturally occurring uranium (from 0.71 to 0.89 percent). 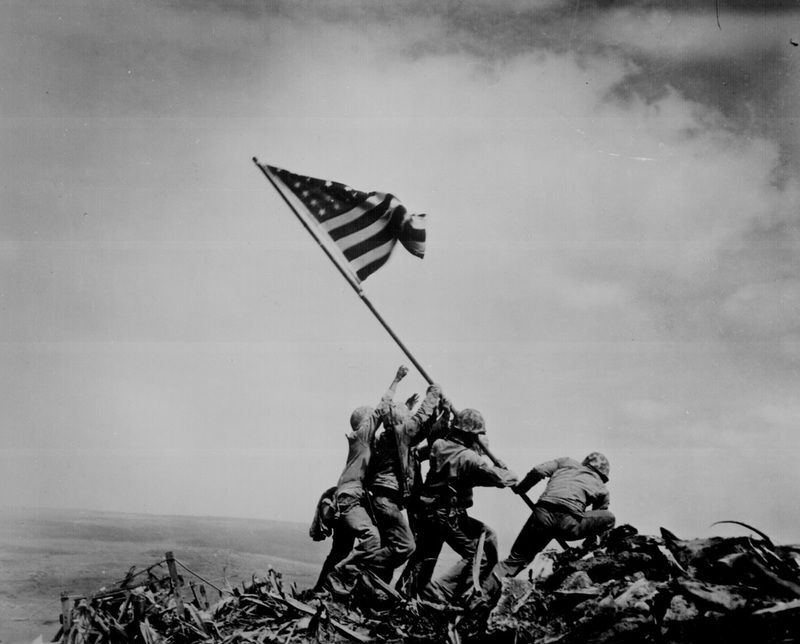 U.S. troops secure the island of Iwo Jima. 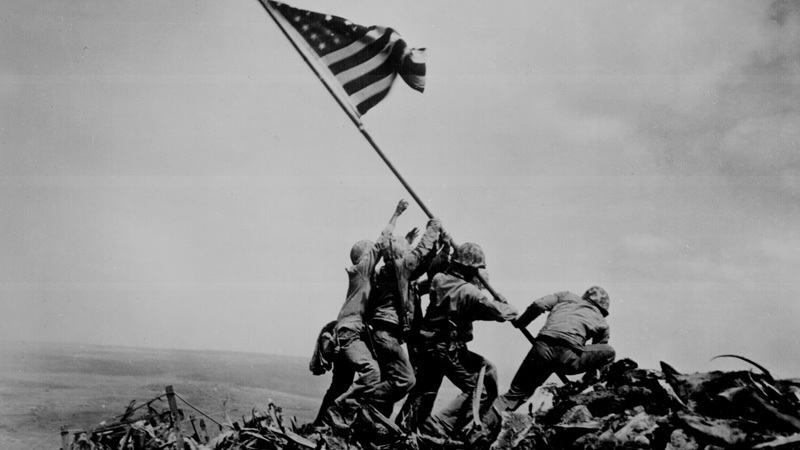 Nearly 7,000 marines lose their lives in the 36-day battle. First uranium product from K-25 Plant shipped to the Y-12 Electromagnetic Separation Plant for additional enrichment. 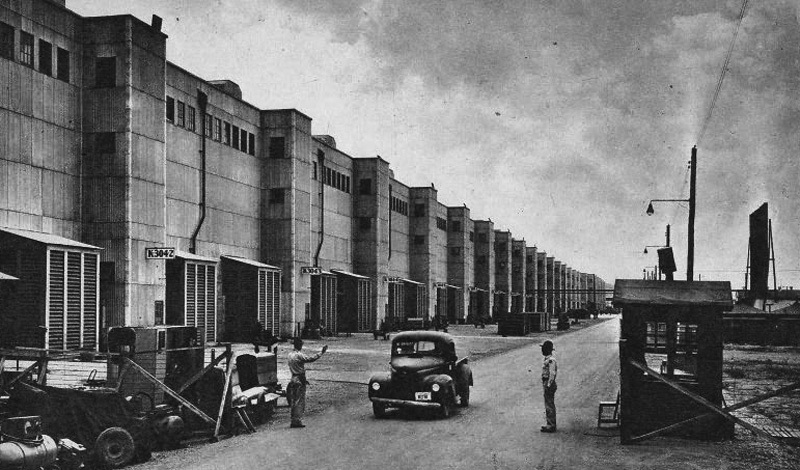 As no enrichment facility was fully operational, a combination of methods would be used to produce quantities required for weapon production. K-25's initial product is enriched to 0.826 percent, only slightly higher than naturally occurring uranium (0.711 percent). 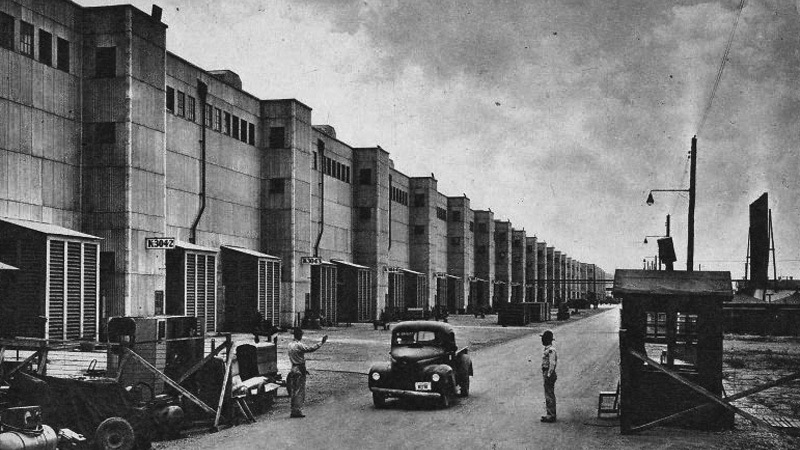 However, uranium product assay progressively increased to 7% in June 1945, exponentially increasing output of the Y-12 Plant. K-25 product assay continued to rise steadily in 1945 to 12% in July and 23% between August and October. Construction begins on second gaseous diffusion building, K-27. 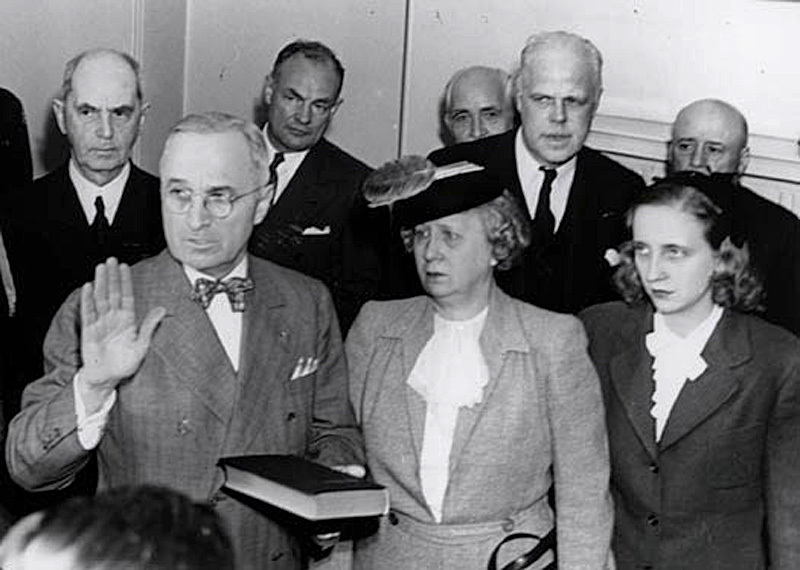 President Franklin Roosevelt dies; Harry S. Truman becomes the 33rd president. 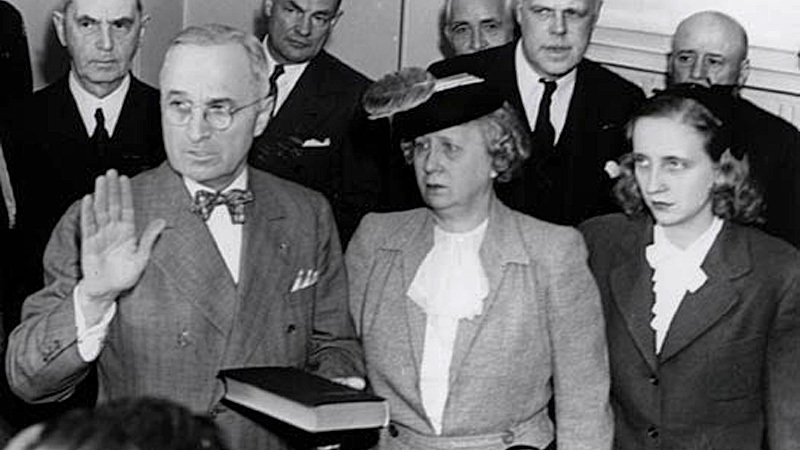 On April 24, President Truman is briefed on the Manhattan Project – from inception to current status. Total employment at the K-25 plant peaks at 25,266. 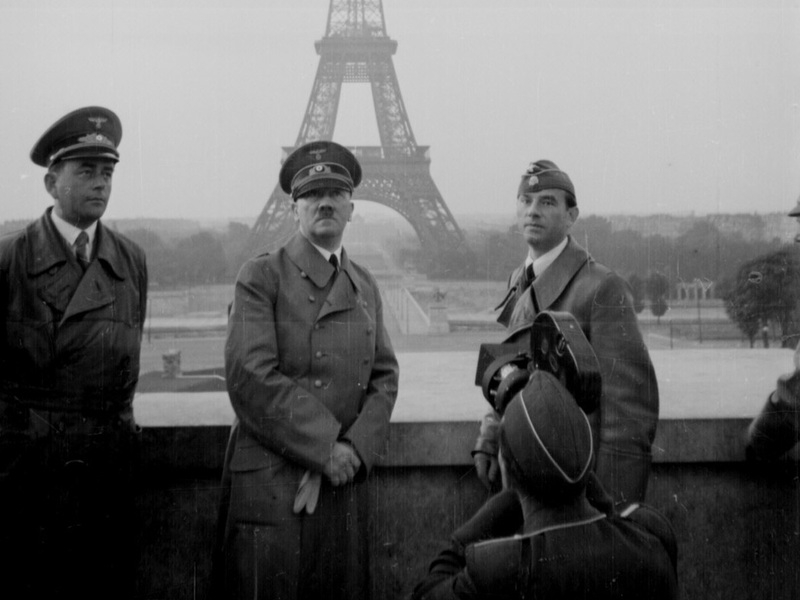 Germany surrenders unconditionally to allied forces at Reims, France. After 82 days of engagement, Allied forces seize the island of Okinawa. More than 200,000 Americans, Japanese, and Okinawans die in what becomes the "bloodiest battle" of the Pacific. At 5:30 a.m., Los Alamos scientists detonate the first atomic (plutonium) bomb at a test site named "Trinity," located on the U.S. Air Force base at Alamogordo, New Mexico. 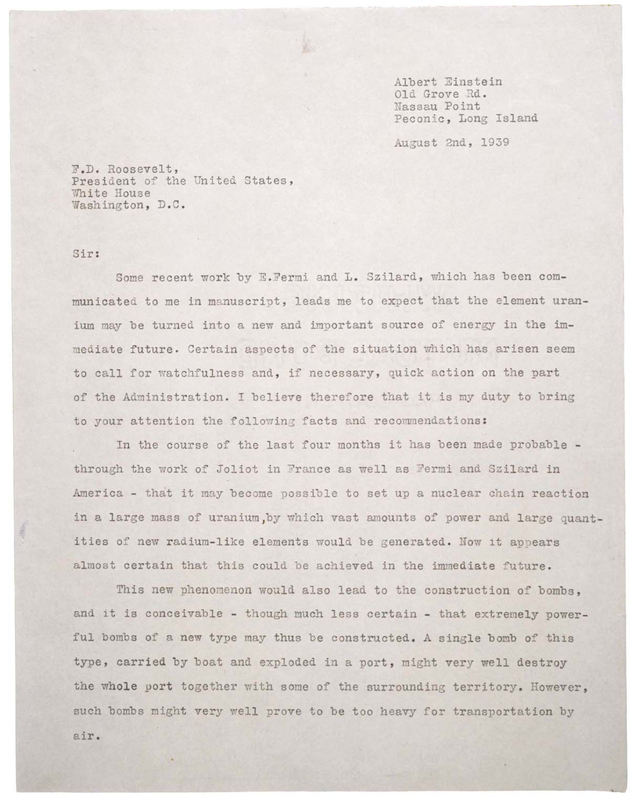 Potsdam Declaration calls for unconditional surrender of Japan or warns of "prompt and utter destruction." Three days later, Japan rejects Potsdam terms. 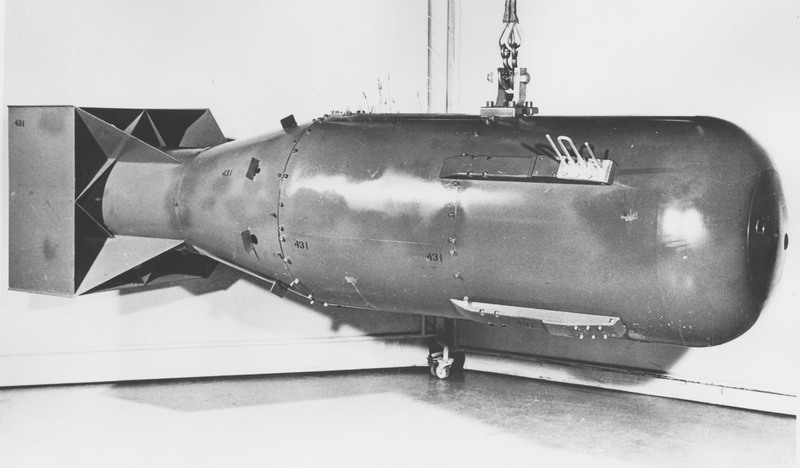 Little Boy atomic bomb dropped on Hiroshima, Japan. 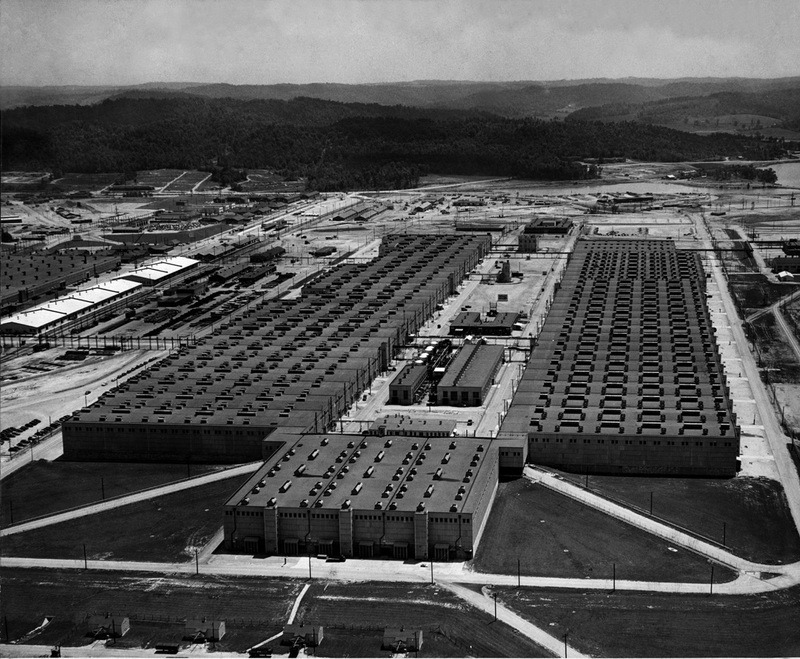 The weapon, the first ever used in warfare, was fueled by enriched uranium produced in Manhattan Project facilities in Oak Ridge. 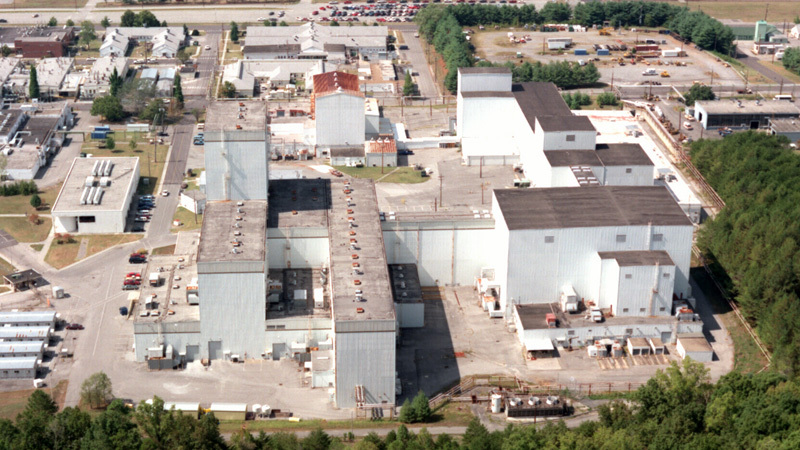 The K-25 Gaseous Diffusion Plant, fueled by natural uranium feed and slightly enriched uranium from both the S-50 Liquid Thermal Diffusion Plant and the Y-12 Plant, produced uranium enriched to approximately 23%. 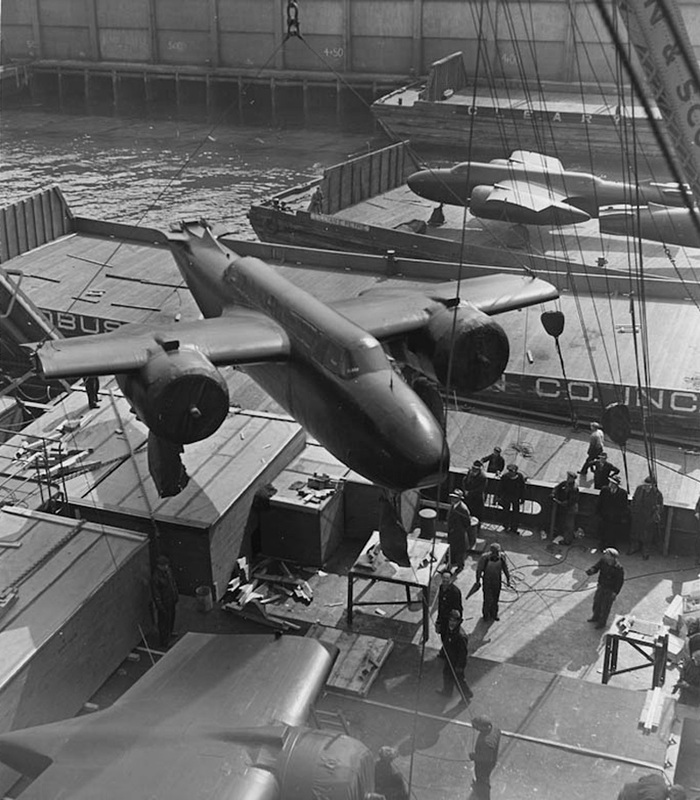 K-25 product was then transported to Y-12 Electromagnetic Separation Plant for final enrichment. 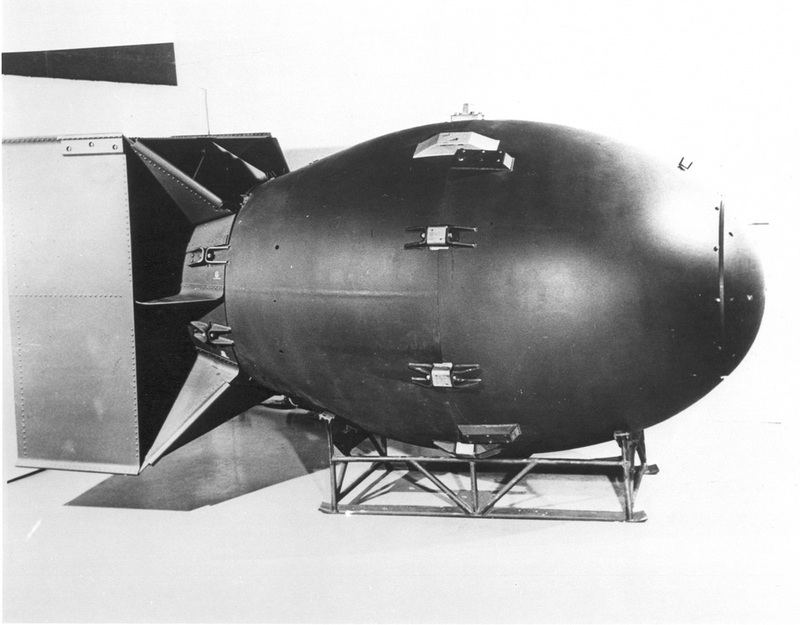 Fat Man atomic bomb (plutonium-fueled) dropped on Nagasaki, Japan. 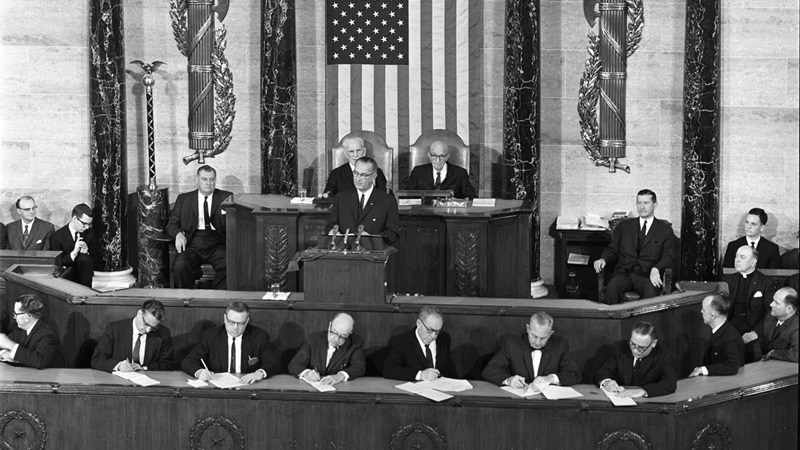 At 7 p.m., President Truman announces Japan's agreement to conditions of Potsdam Declaration. All 54 units of K-25 fully operational – 24 months after construction begins. 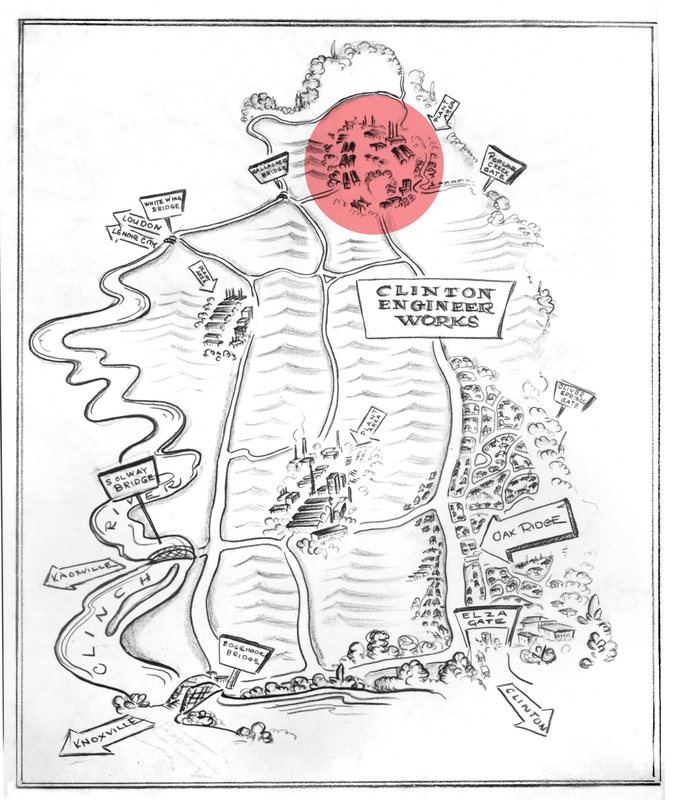 That same month, power consumption peaked for Clinton Engineer Works facilities, reaching 200,000,000 kWh. That is enough electricity to power 20,000 homes for a year. General Douglas MacArthur, Supreme Allied Commander, accepts Japan's unconditional surrender aboard the U.S.S. Missouri. With the success of the gaseous diffusion process, the S-50 liquid thermal diffusion process ceases operations. 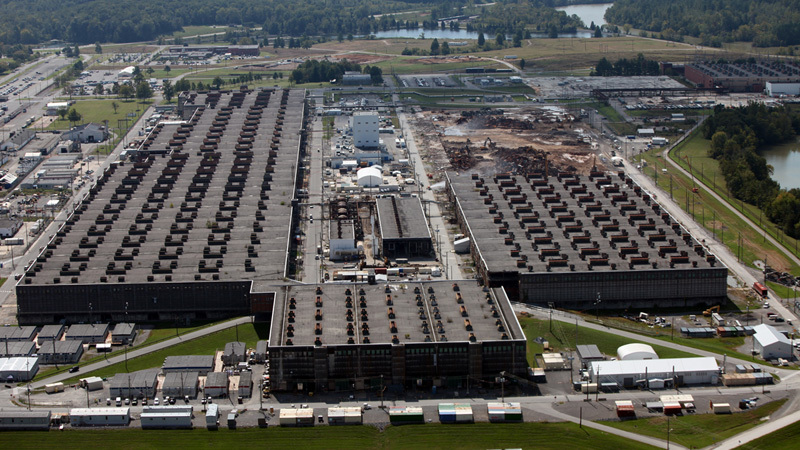 Eight months after construction begins, first three units of K-27 are operational. K-25 enrichment reaches 28 percent; 90-plus percent enrichment is required for weapons production. 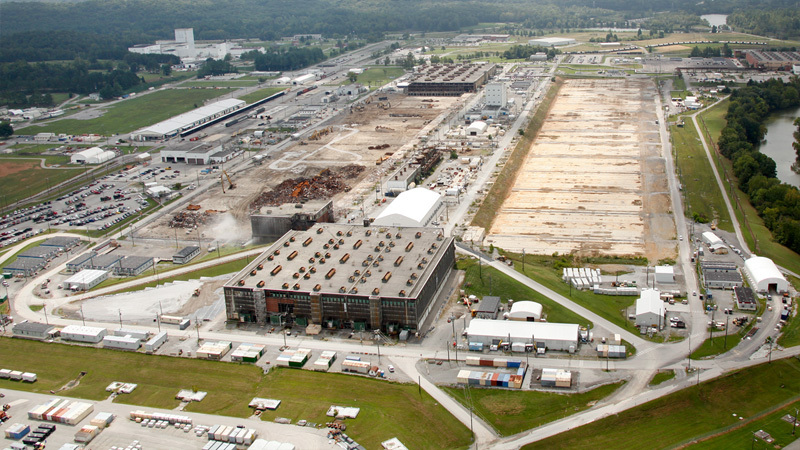 Last two units in K-27 operational; process lines tie K-25 to K-27 to expand the uranium enrichment capacity. 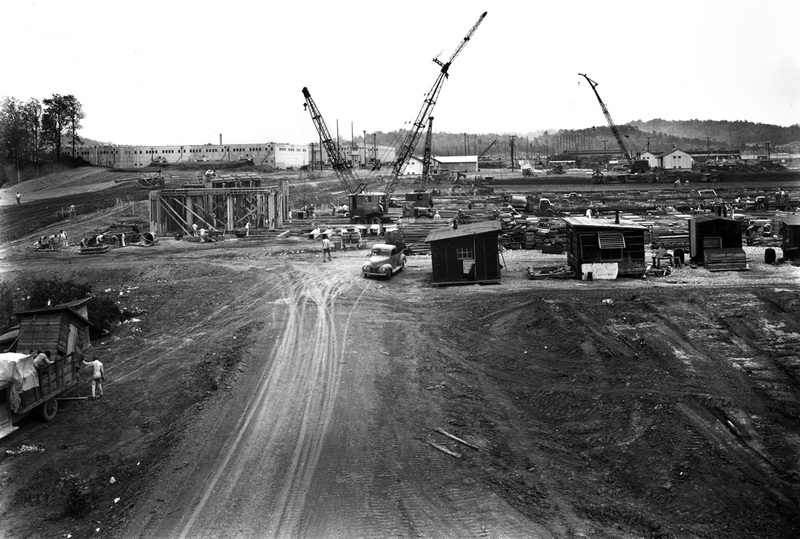 Atomic Energy Act signed; transferred atomic research and development responsibilities from the U.S. Army to a five-member civilian board known as the Atomic Energy Commission. 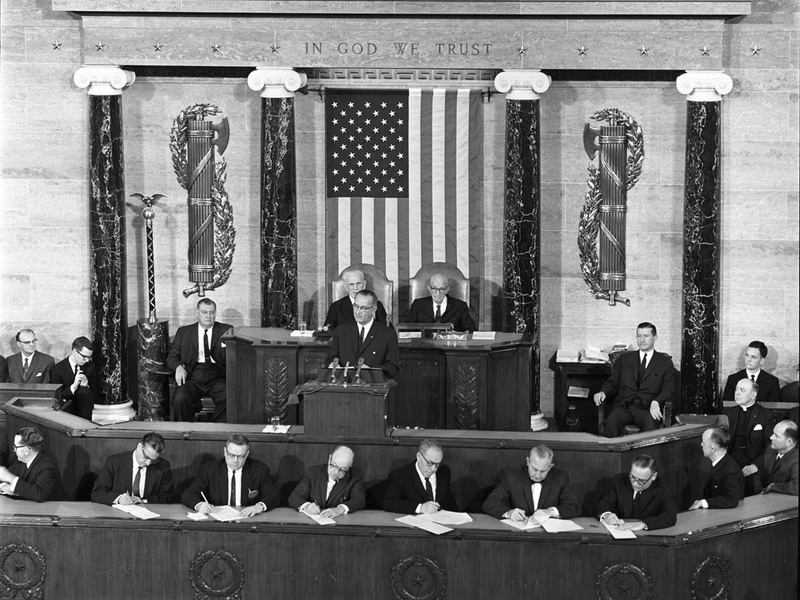 The Act became effective on January 1, 1947. K-25 enrichment reaches weapons-grade output (90-plus percent). 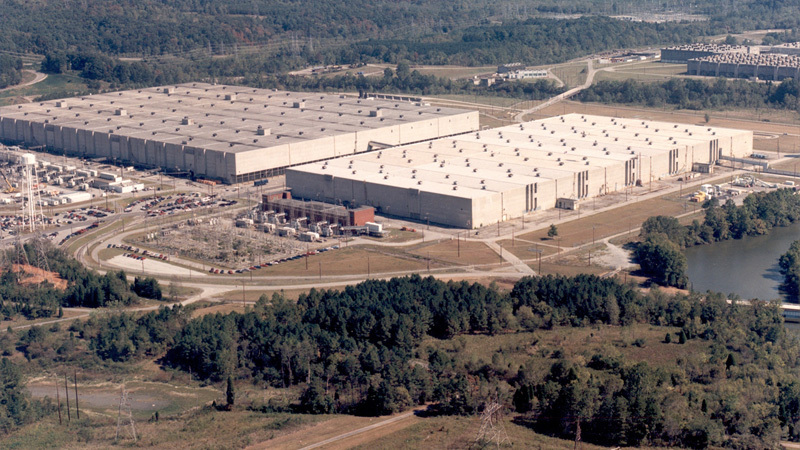 The electromagnetic separation facility at Y-12 is shut down, making K-25 gaseous diffusion plants sole U.S. supplier of enriched uranium. On-site barrier plant and uranium feed plant begin operations. Cascade improvement program begins. Over the course of 30 years, major improvements and upgrades to the U.S. gaseous diffusion process will improve production by 60 percent without increasing plant size. 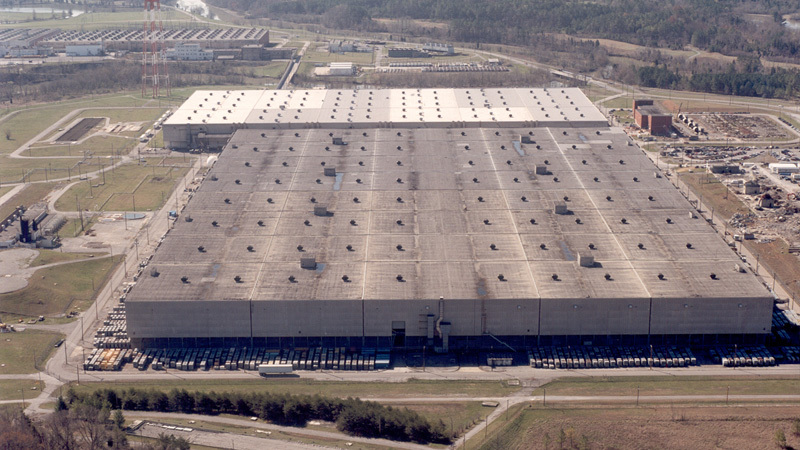 Gaseous diffusion production expands with the construction of a plant in Paducah, Kentucky. 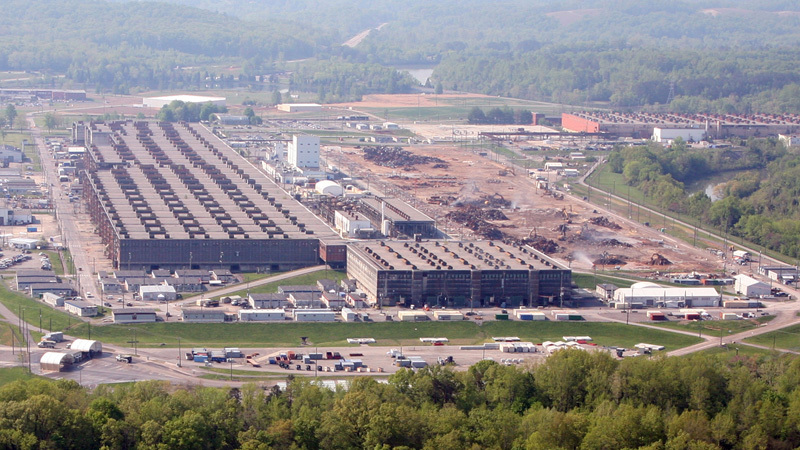 K-29, Oak Ridge's third gaseous diffusion process building, becomes operational. The site's fourth gaseous diffusion process building, K-31, begins operations. 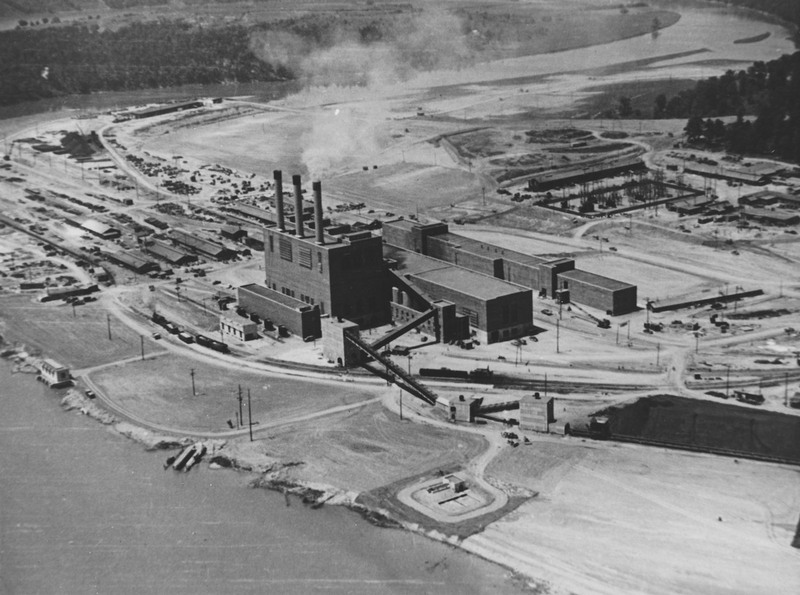 Plans announced for expansion of Oak Ridge and Paducah plants and for construction of a new gaseous diffusion facility at Portsmouth, Ohio. 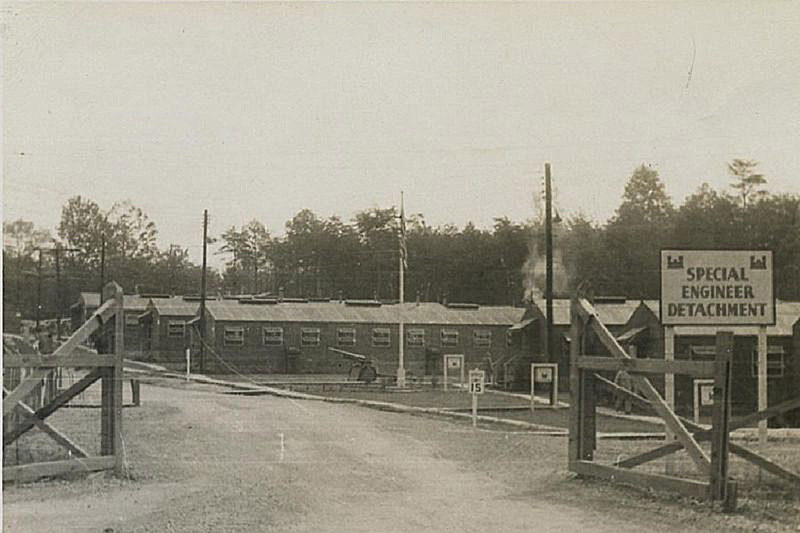 K-25 facilities were training ground for many key personnel deployed to Paducah and Portsmouth. 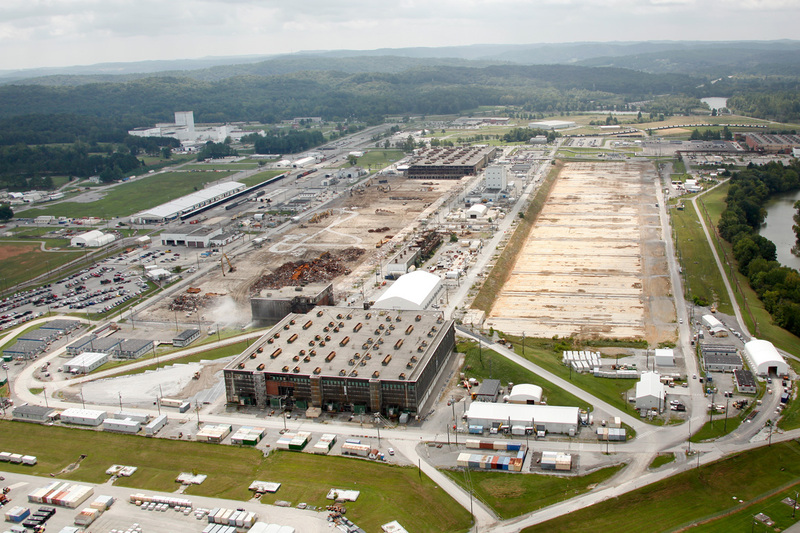 Interplant operations begin between Oak Ridge and Paducah gaseous diffusion plants. 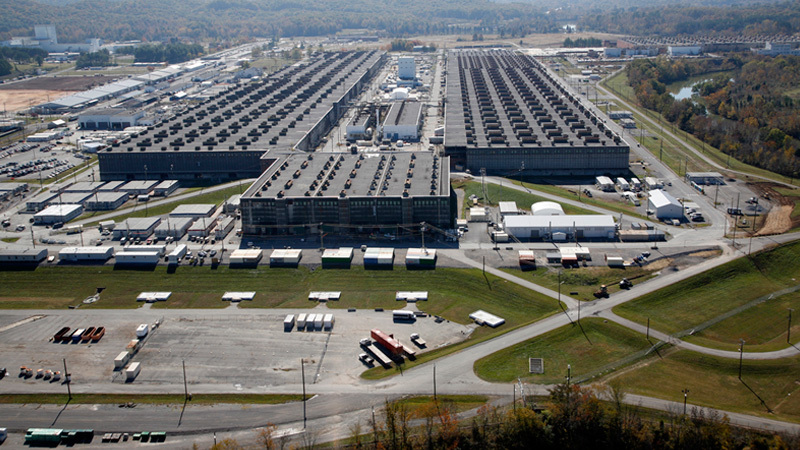 The fifth and final gaseous diffusion process building in Oak Ridge, K-33, begins operations. 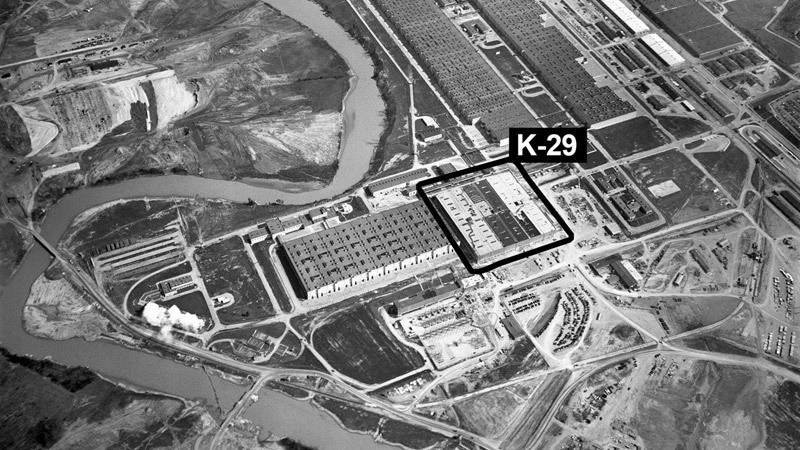 K-25 serves as the final link in a multi-building production chain - including Buildings K-27, K-29, K-31, and K-33 − that produces weapons-grade enriched uranium. First shipment of enriched uranium made under Atomic Energy Commission's Civilian Applications Program. 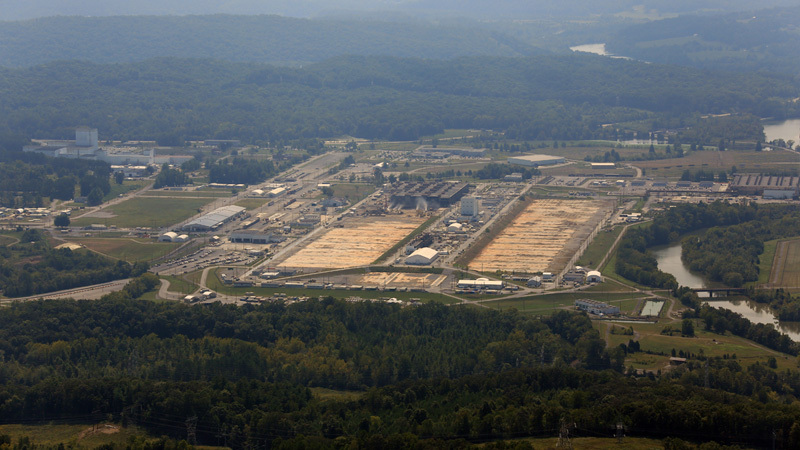 Atomic Energy Commission initiates experimental work on centrifuge technology at the K-25 site. Back in 1919, scientists suggested the use of gas centrifuge as a method of isotope separation. In 1934, Dr. Jesse Beams at the University of Virginia successfully demonstrates the first isotope separation using the gas centrifuge method. 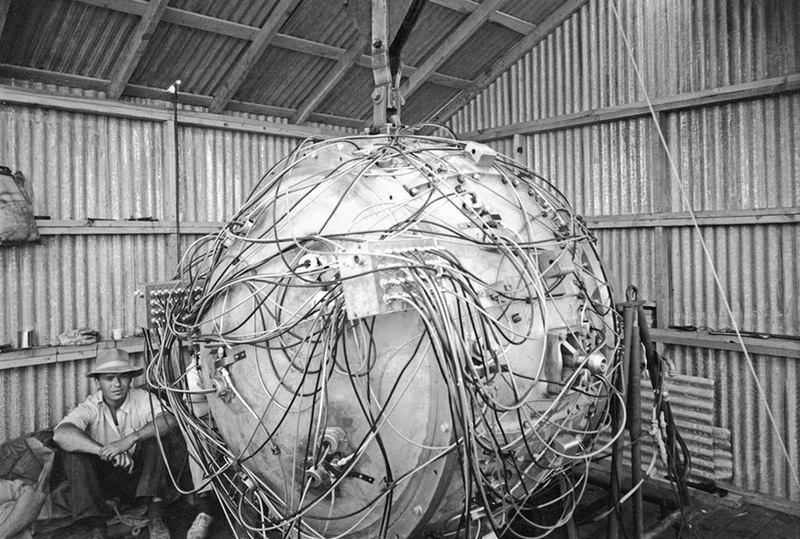 Due to several inherent technical problems in the approach, Manhattan Project leadership rejected the centrifuge method for further development. From 1946-1958, Russia continued to develop the gas centrifuge method. 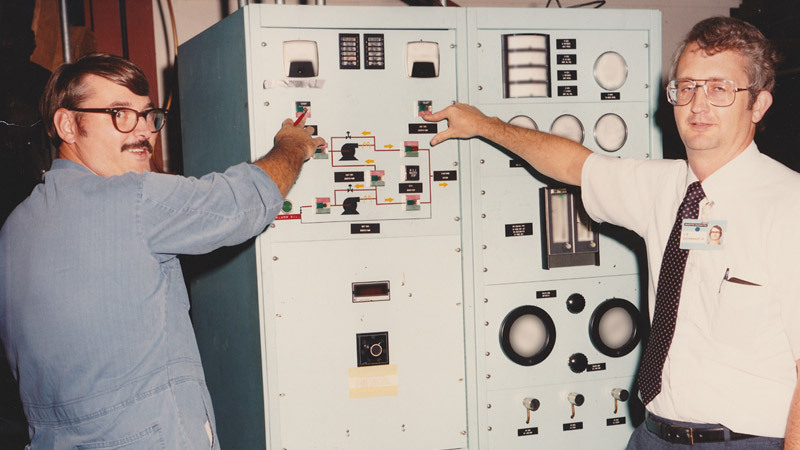 The U.S. reactivated its centrifuge work in the mid-1950s at the University of Virginia. 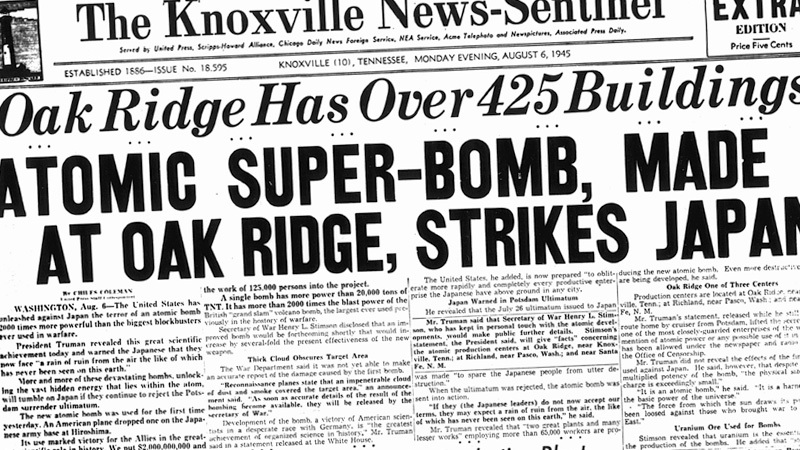 The first centrifuge cascades (35) operate successfully at Oak Ridge, demonstrating gas centrifuge feasibility. 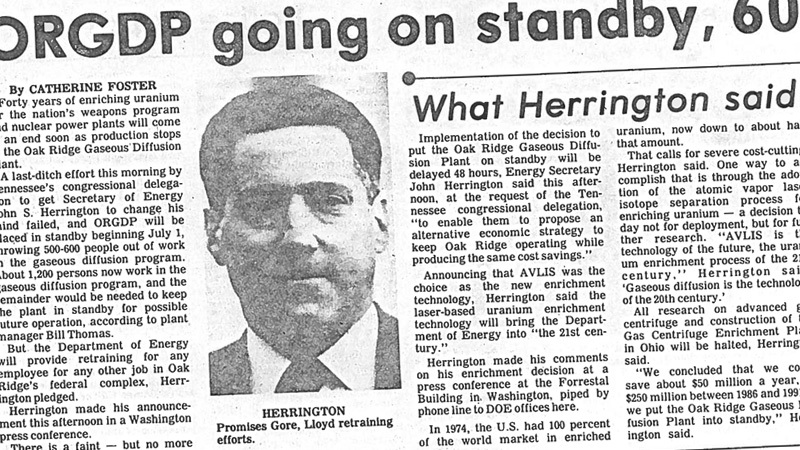 Technology advancement continues through the mid-1980s. 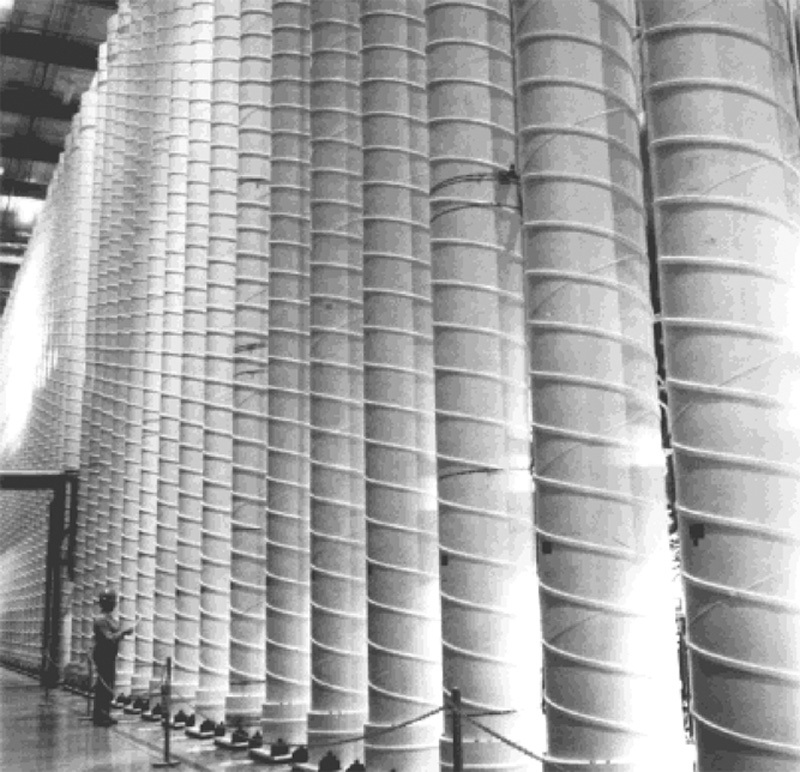 Gaseous diffusion plants ship their millionth pound of uranium hexafluoride for use in the Civilian Applications Program. 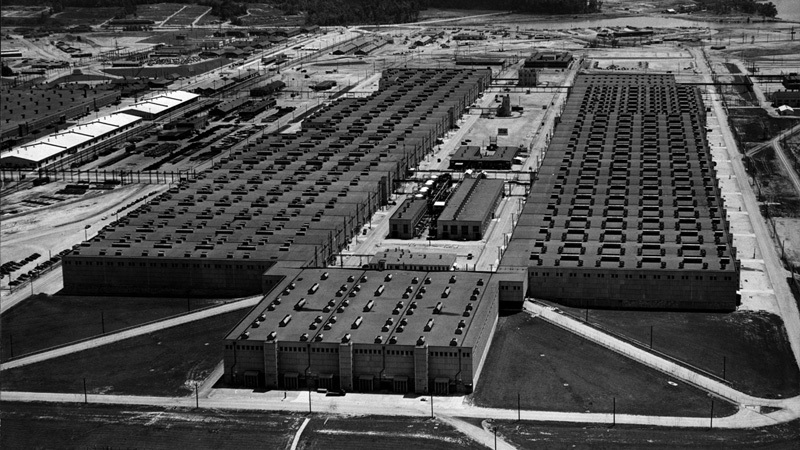 K-25 and K-27 process buildings shut down as a result of President Lyndon Johnson's order to reduce national enriched uranium production by 25 percent. Two units in K-25 continue to operate as a "purge cascade" to remove nitrogen, oxygen, and other light gases from process equipment. 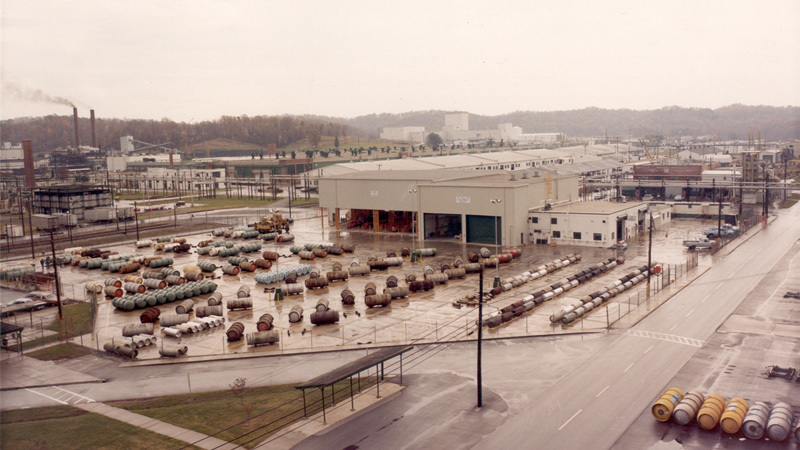 Oak Ridge Gaseous Diffusion Plant, in cooperation with the Oak Ridge National Laboratory, develops a centrifuge for producing ultra-pure vaccines. Patented by the government and transferred to industry, these centrifuges were used by Dr. Jonas Salk for early batches of his polio vaccine and by Eli Lilly Company to produce the first large batches of purified influenza vaccine. 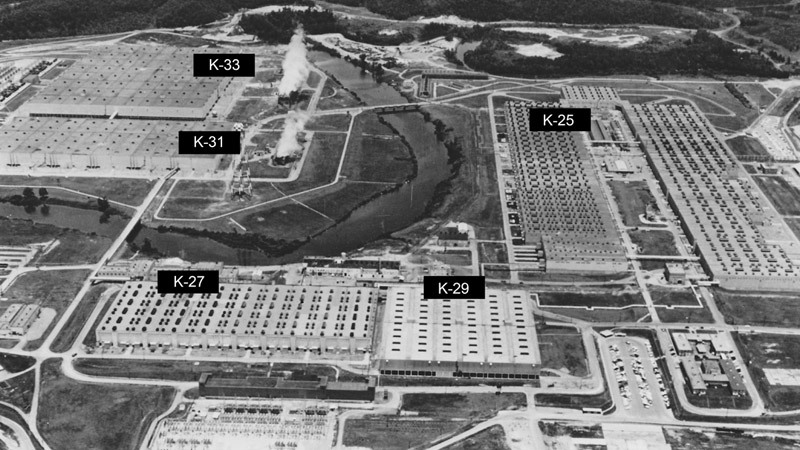 K-25 found new life when a "toll enrichment" program was created to provide low enrichment (3-5 percent) uranium for fuel in civilian power reactors; Japan was the site's biggest customer. Centrifuge Test Facility (K-1210) begins operation. President Carter announces plans to use centrifuge technology for the next enrichment plant to be built in Ohio. The purge cascade in K-25 was replaced with an improved purge cascade in K-27 for removal of nitrogen, oxygen, and light gases from the process. The K-25 purge cascade soon shuts down. 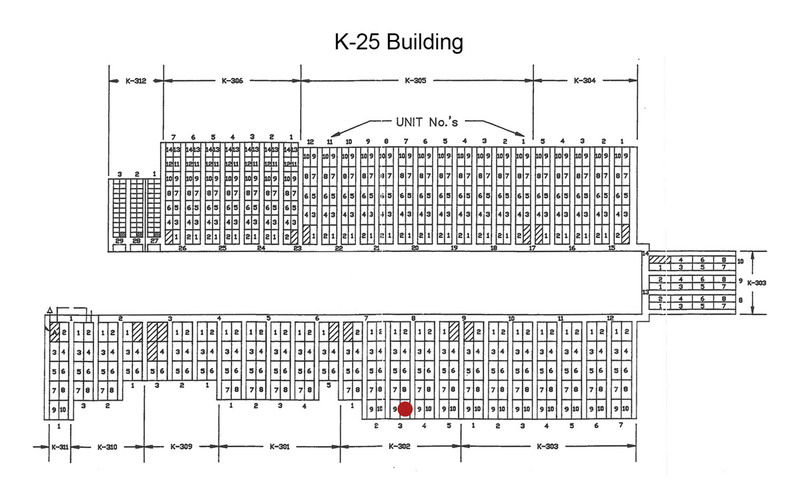 Advanced Equipment Test Facility (K-1210-A) constructed on the site. 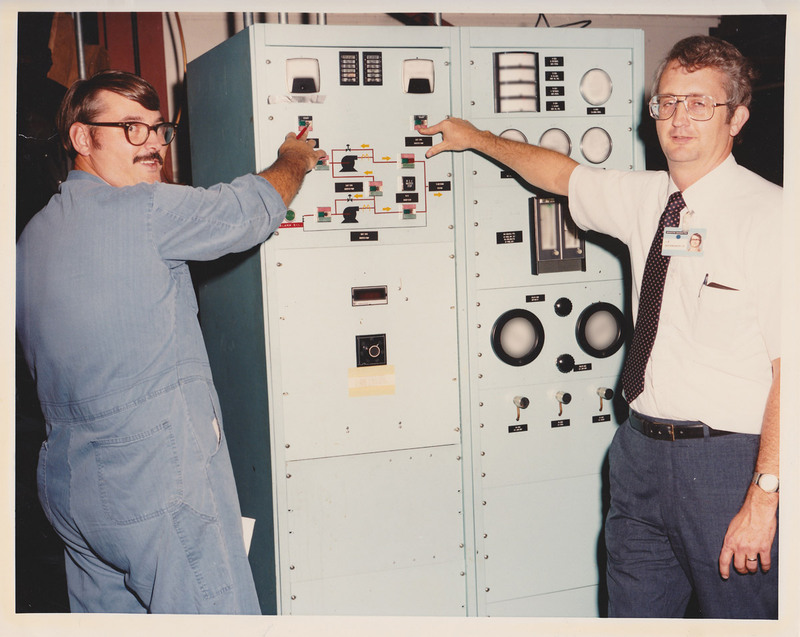 The facility was used from 1978 to 1985 to test reliability of production centrifuges. 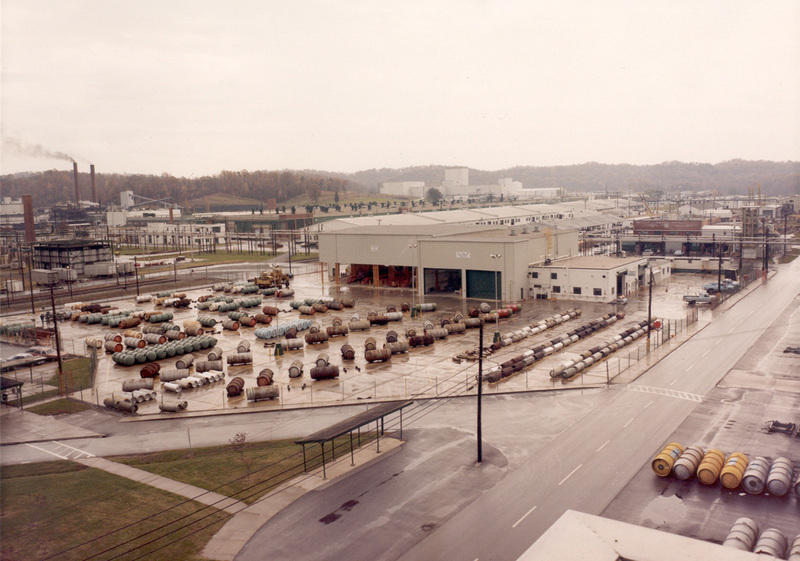 Centrifuge Plant Demonstration Facility (K-1220) built on the site to test production centrifuges and successfully demonstrates the producibility, constructability, and operability of equipment for a gas centrifuge enrichment plant in Ohio. The Department of Energy begins large-scale engineering, development and demonstration efforts on Atomic Vapor Laser Isotope Separation (ALVIS). Site employees contribute to design and operation of the full-scale demonstration module as well as conceptual design studies for an ALVIS production plant. 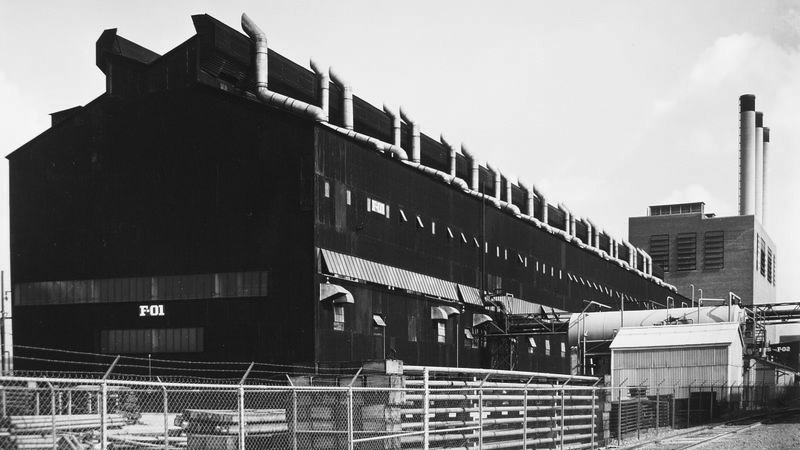 Barrier Plant (K-1037) shut down. Materials Handling Demonstration Module, key component of the AVLIS process, installed at former ORGDP Barrier Plant (K-1037). Martin Marietta Energy Systems becomes contractor at ORGDP, replacing Union Carbide - Nuclear Division. 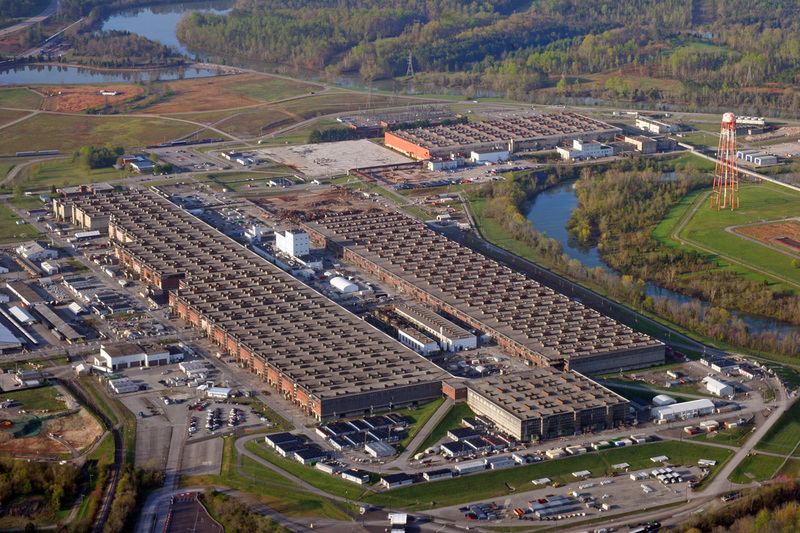 The Department of Energy announces that gaseous diffusion operations at Oak Ridge will be shut down and placed in standby as soon as possible after 40 years of service. All research and development work on the advanced gas centrifuge program would be terminated. AVLIS is selected as the enrichment process of the future. 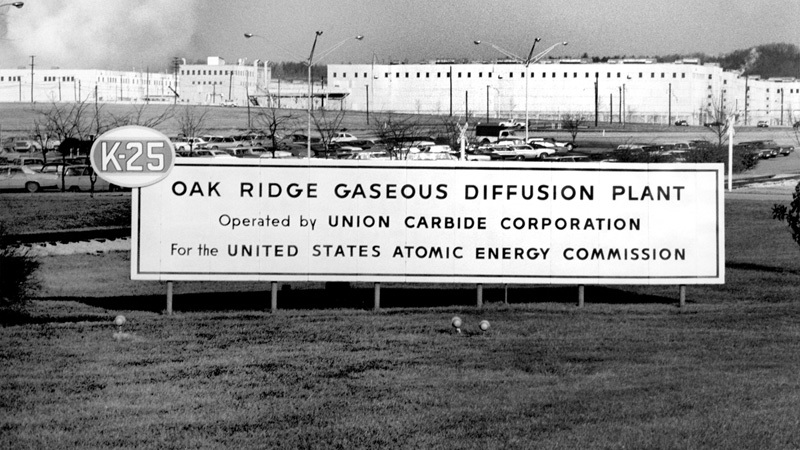 At 3:31 p.m., the final gaseous diffusion operating equipment at Oak Ridge shuts down. 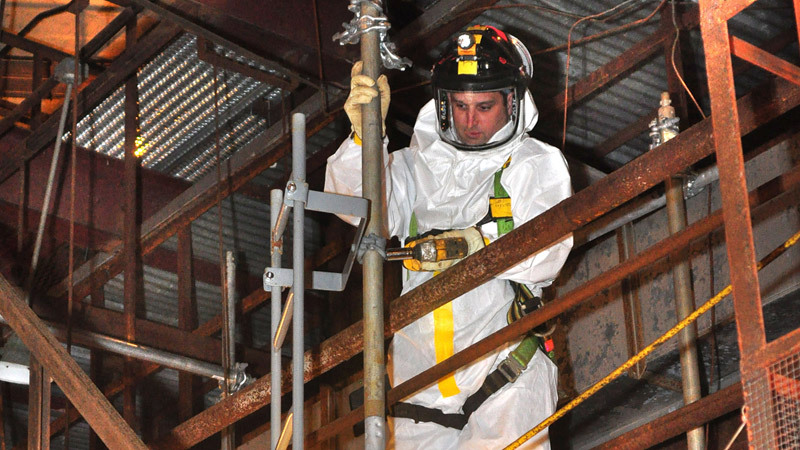 The Department of Energy begins a major environmental cleanup effort. 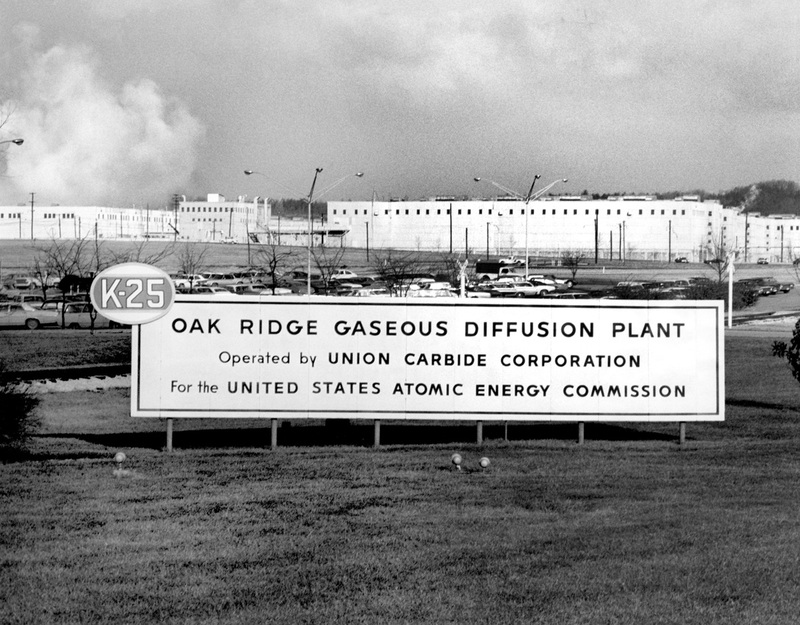 Oak Ridge Gaseous Diffusion Plant renamed Oak Ridge K-25 Site. 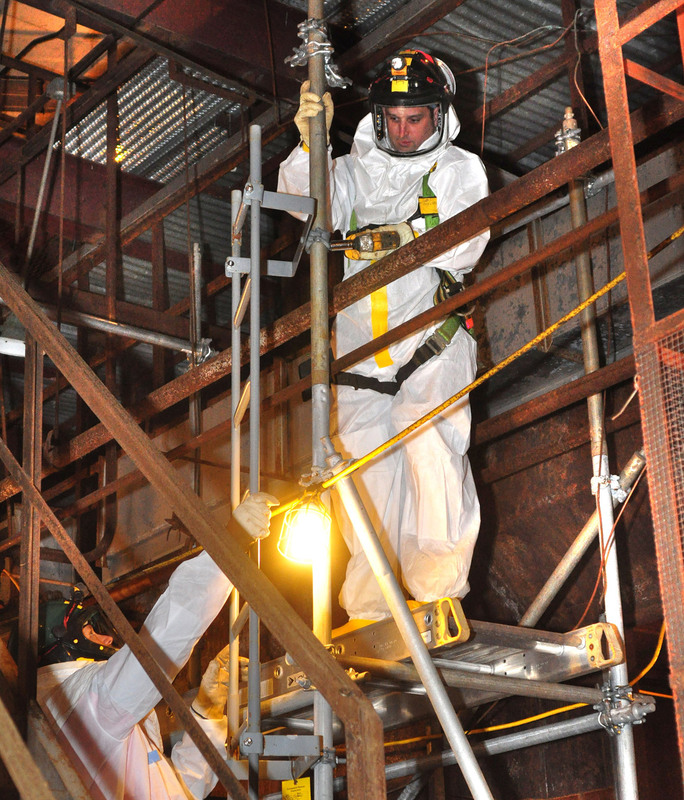 Toxic Substances Control Act (TSCA) Incinerator begins operation treating hazardous and radioactive wastes containing polychlorinated biphenyls from the gaseous diffusion process buildings and other DOE facilities. 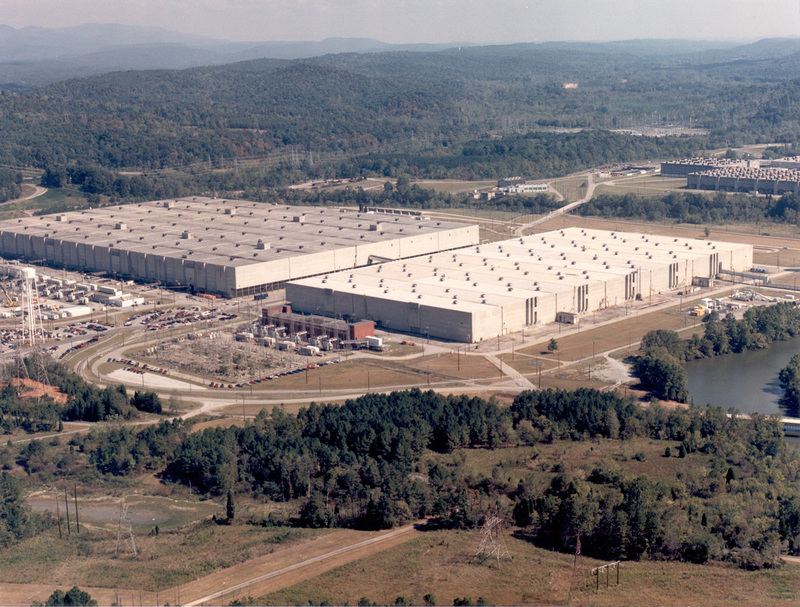 The Oak Ridge K-25 Site becomes the East Tennessee Technology Park (ETTP) to reflect the Department of Energy's long-term goal of converting the site into a private-sector industrial park. The Community Reuse Organization of East Tennessee (CROET) is established with its initial focus on the lease of underutilized facilities. A portion of ETTP is designated a brownfield site called The Heritage Center. 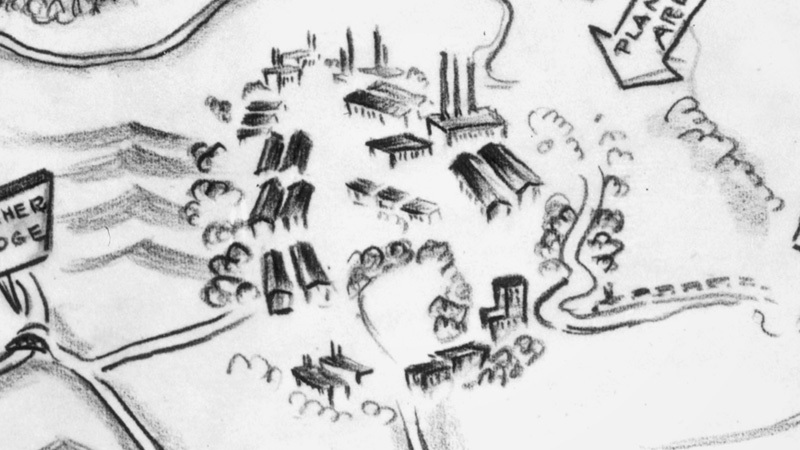 Just east of the brownfield site known as The Heritage Center, CROET establishes a greenfield industrial park, the Horizon Center. The Horizon Center is over 1,000 acres and approximately half of it is set aside for environmental conservation, greenways, and wildlife corridors. 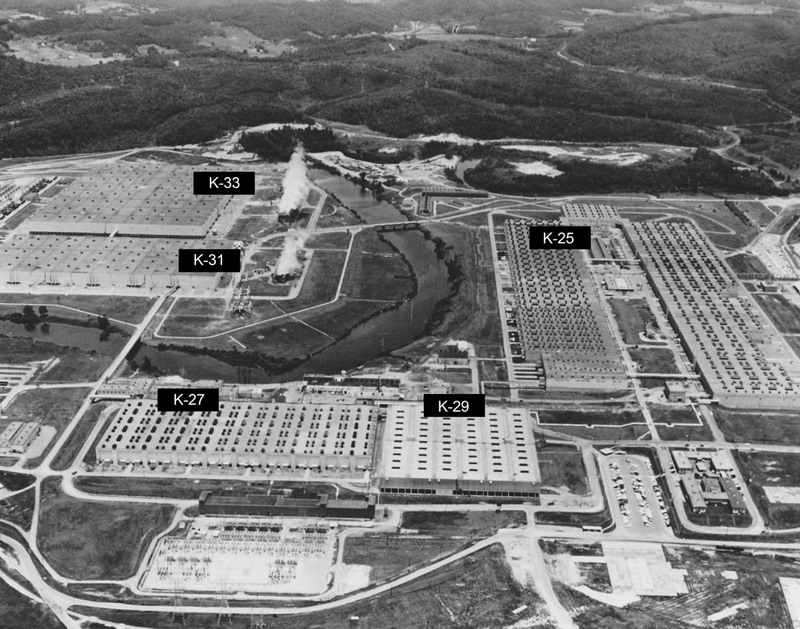 The Department of Energy designates K-25 as a Manhattan Project "Signature Facility" for its essential role in interpretation of the historic project. Deactivation activities begin at K-25. The Environmental Management Waste Management Facility (EMWMF) disposal site opens to accept contaminated waste from numerous cleanup projects. CROET's emphasis transitions from leasing to title transfer, which enhances the development opportunities at the site. 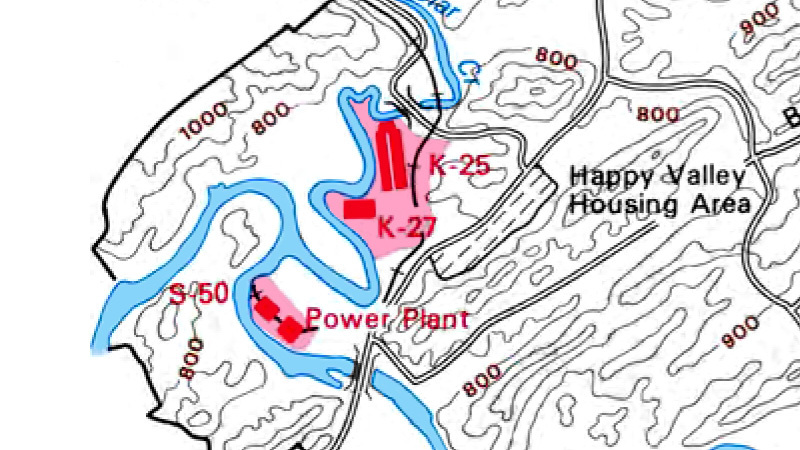 The Black Oak Ridge Conservation Easement (BORCE) is established as part of a Natural Resources Damage Assessment compensation for environmental impacts to the Watts Bar Reservoir. The BORCE includes nearly 3,000 acres as a permanent easement that is managed by the Tennessee Wildlife Resources Agency. Completed off-site shipment of approximately 6,000 cylinders of depleted uranium hexafluoride and another 1,200 empty and near-empty cylinders containing residual uranium compounds from the ETTP. Depleted uranium hexafluoride is a by-product of the uranium enrichment process. DOE transfers the K-25 Fire Station (Building K-1652) to the City of Oak Ridge. K-25 demolition begins. Demolition was completed on December 19, 2013. 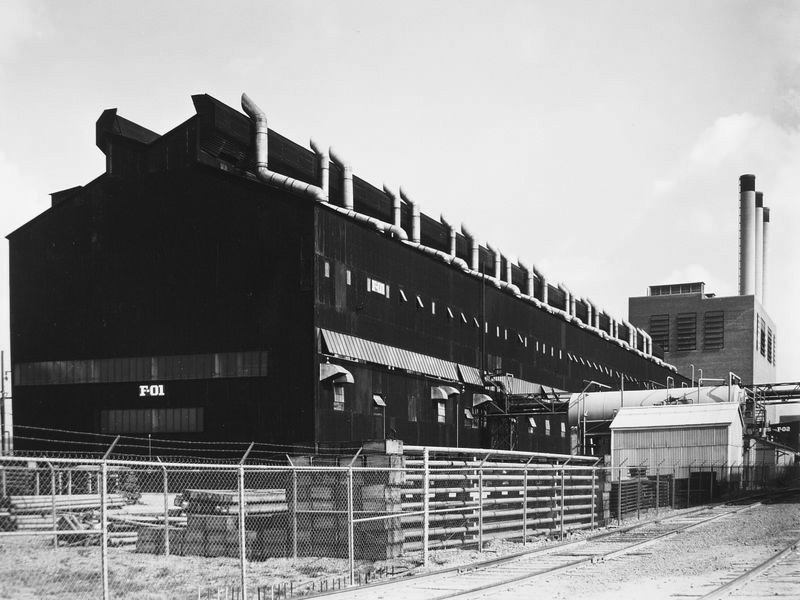 TSCA Incinerator closed after 18 years of service, having treated 35 million pounds of waste. A Memorandum of Agreement signed to preserve historic contributions of the K-25 Site to the Manhattan Project and Cold War. Information contained within this website has been reviewed and approved for public release and has been determined to be unclassified and non-sensitive.